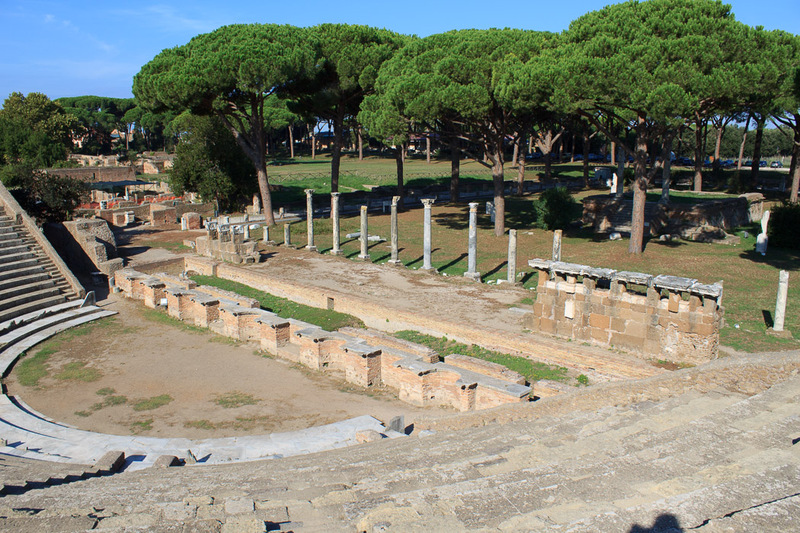 Ostia Antica was ancient Rome's seaport, at the mouth (ostium) of the Tiber River. Antica in the name means "old". It was a working town where imports and exports were transferred between seafaring ships and river boats, and where naval attacks were launched, and where the city was protected from invasion by river. 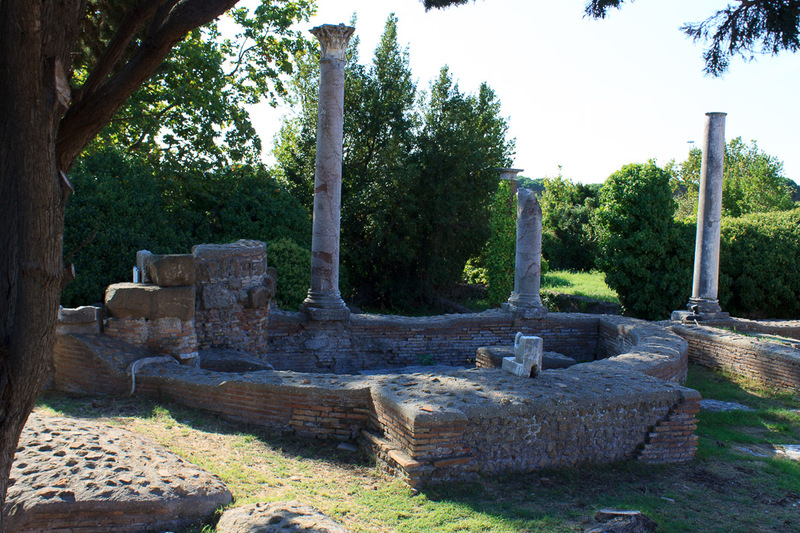 After the the river changed course and the town was abandoned, the mud that buried Ostia protected it for us to see today. 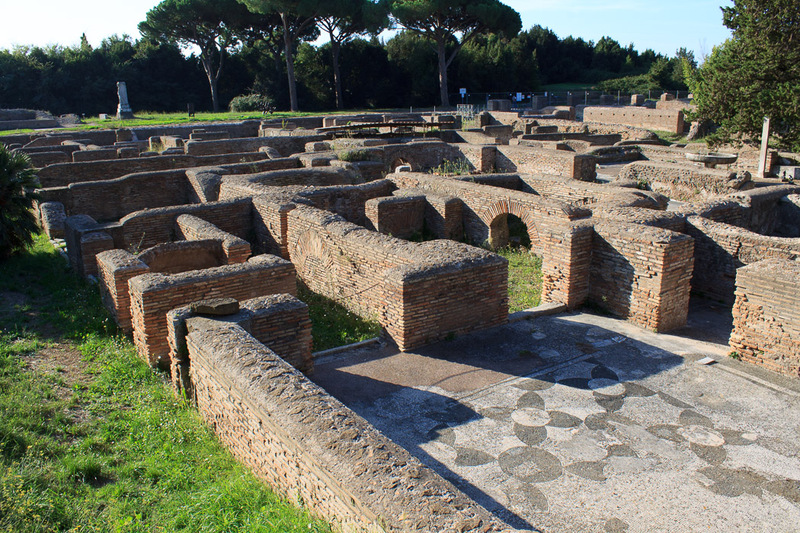 Visiting Ostia Antica involves a lot of walking; be sure to wear comfortable shoes. There is an on-site cafeteria about half way through the site, next to the small museum. Bring a water bottle, save it for refills on site; it can get very hot in the summer sun. 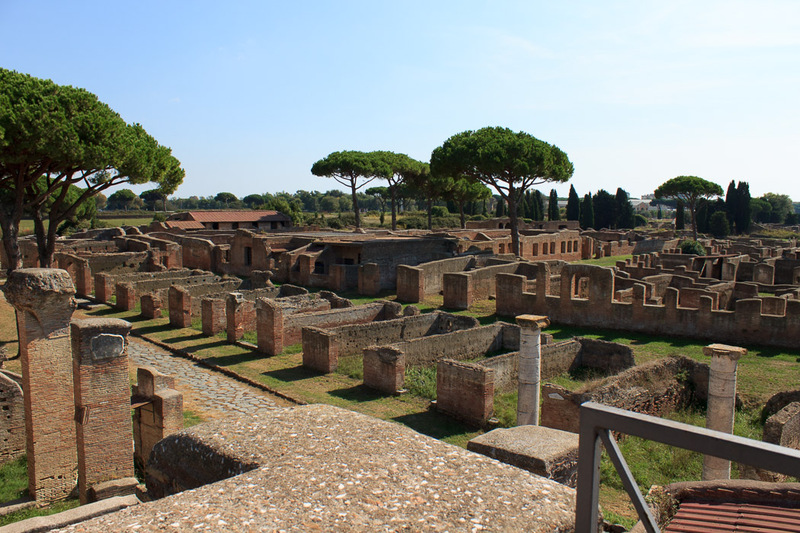 Ostia Antica is similar to its more famous cousin, Pompeii, and this comparison might help you decide which to see. 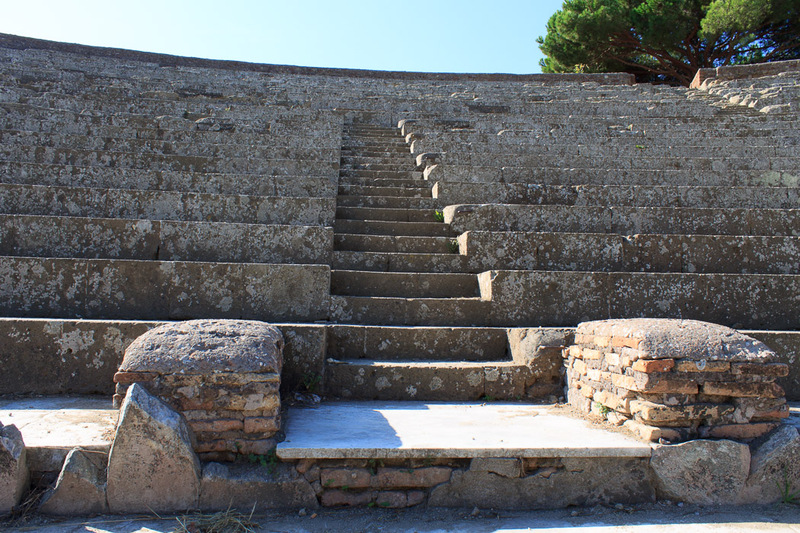 To get to Ostia Antica from Rome, you should take the blue (Line B) metro to Piramide, go up the escalator, turn immediately left and go down the steps into the Roma-Lido station. 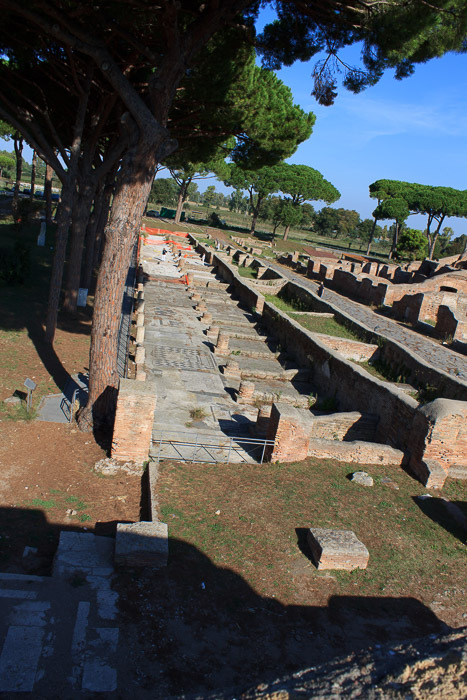 All trains from here go to Lido, passing Ostia Antica along the way. You can use a normal metro ticket or pass for the entire trip. 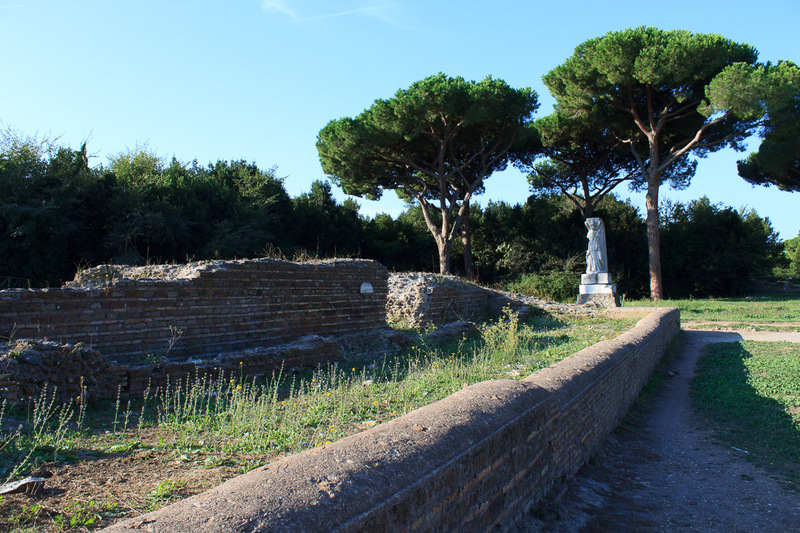 Get out at the Ostia Antica stop, cross the highway using the pedestrian bridge, and continue straight, crossing a busy road. 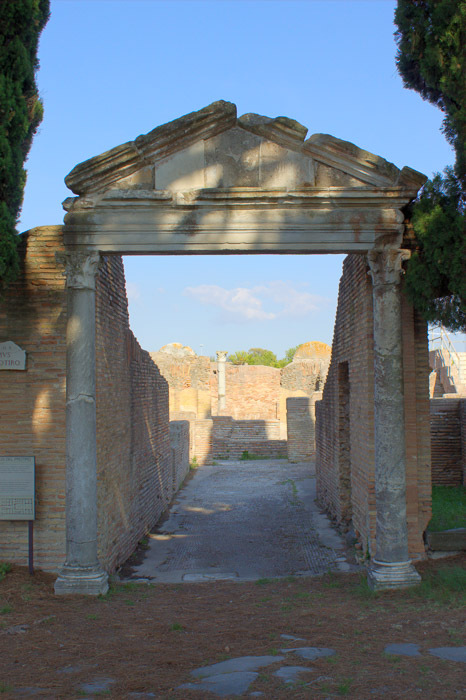 About 100 yards later, the entrance to Ostia Antica is on your left. Be sure to pick up a map, but realize it's only a high-quality map with no descriptions or explanations of the sights. I found the tourist guide pdf file (link at bottom of page) to be very helpful while touring the site. Maybe you can print it before you go. An audio guide might be available, but I didn't rent one so can't vouch for its quality. 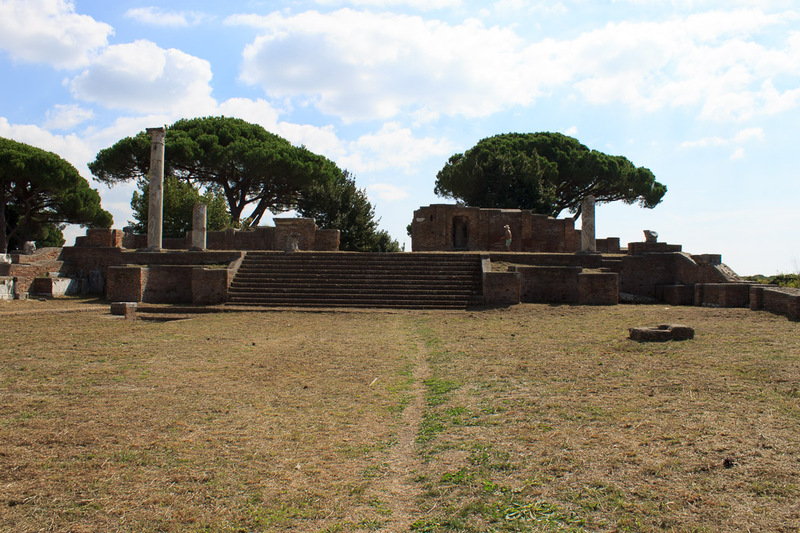 See all Ostia Antica photos. 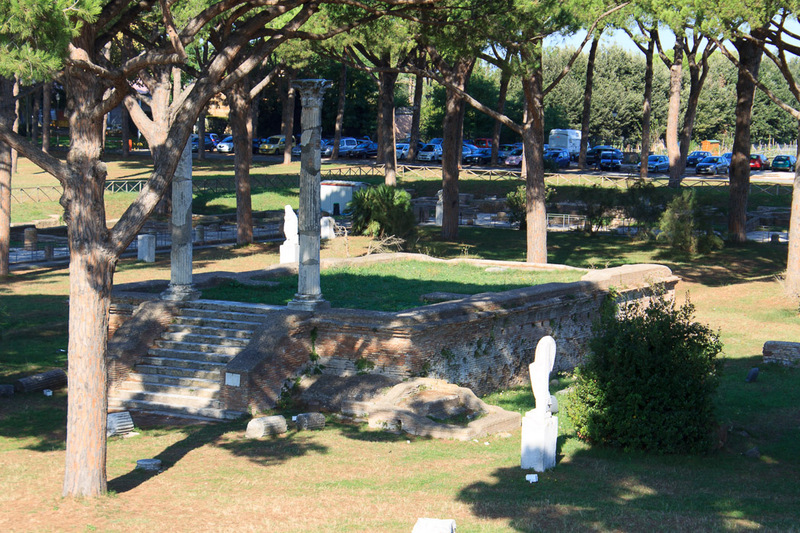 The necropolis (cemetary) is located outside the city walls because that was mandated by law, just like it was in Rome. 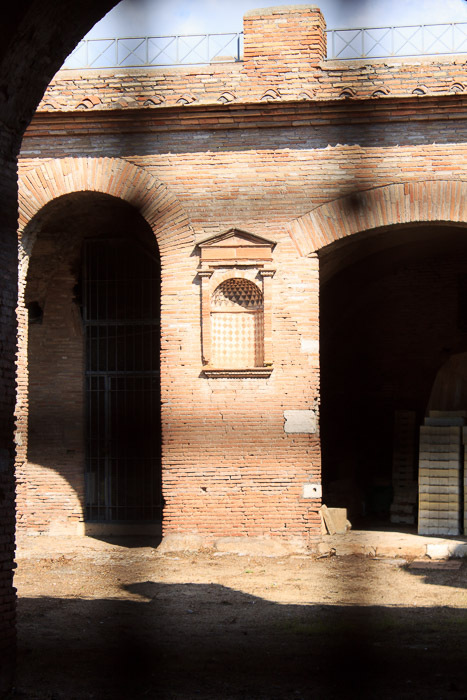 The niches in the walls of the mausoleums (two photos above) were for the urns which held the ashes of the cremated dead. 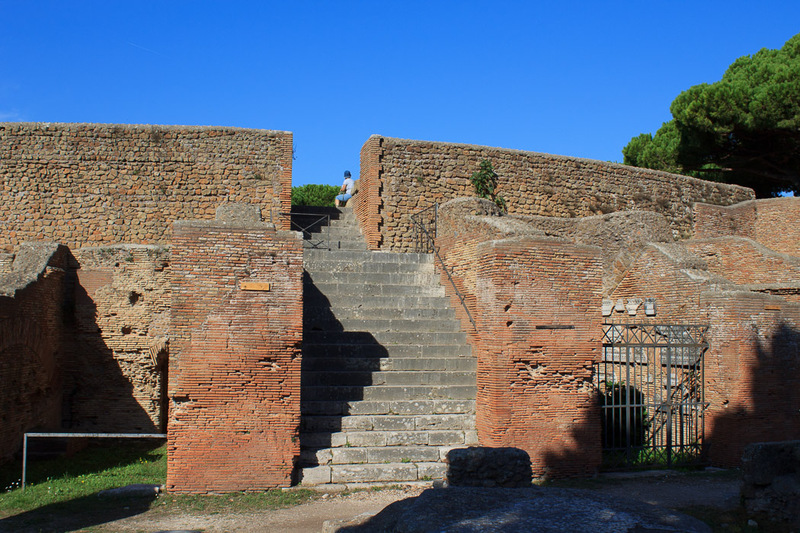 Eventually we reach the Porta Romana (the gate closest to Rome) in the city wall (1st photo below). 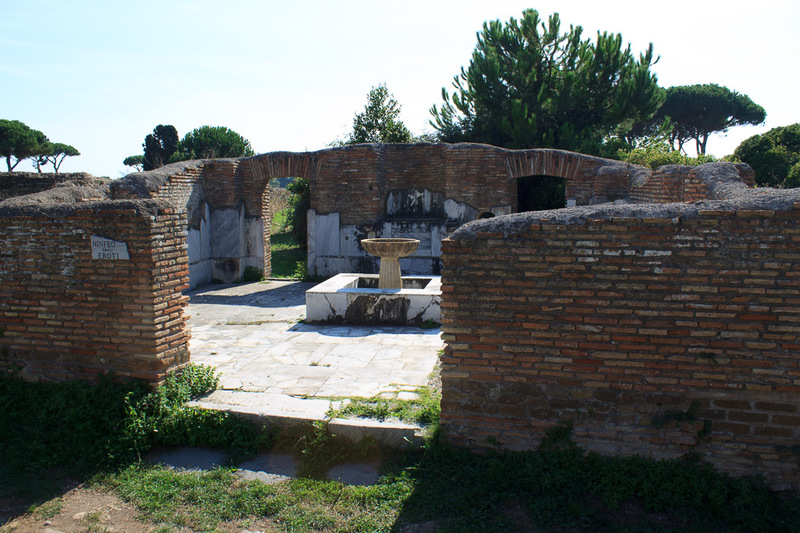 Just inside the gate is the Piazzale della Vittoria, which is a large basin once fed by a fountain, where animals could be watered (2nd photo below). 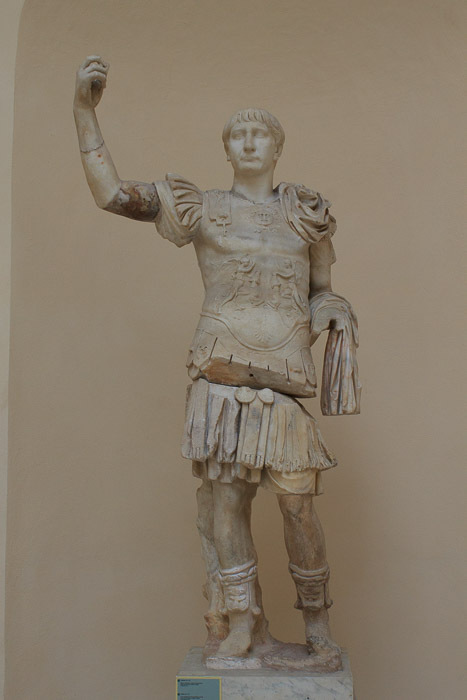 A statue of Victory is at the end of the basin. 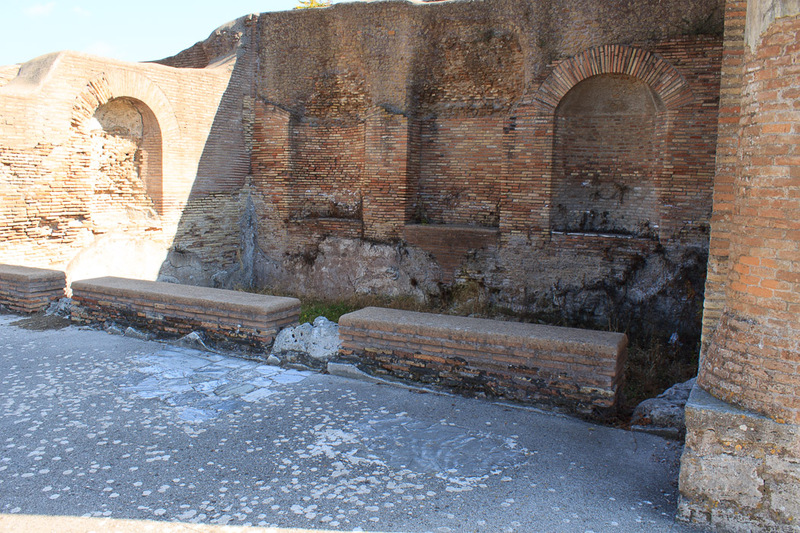 The Baths of the Coachmen are the next building you'll come upon. 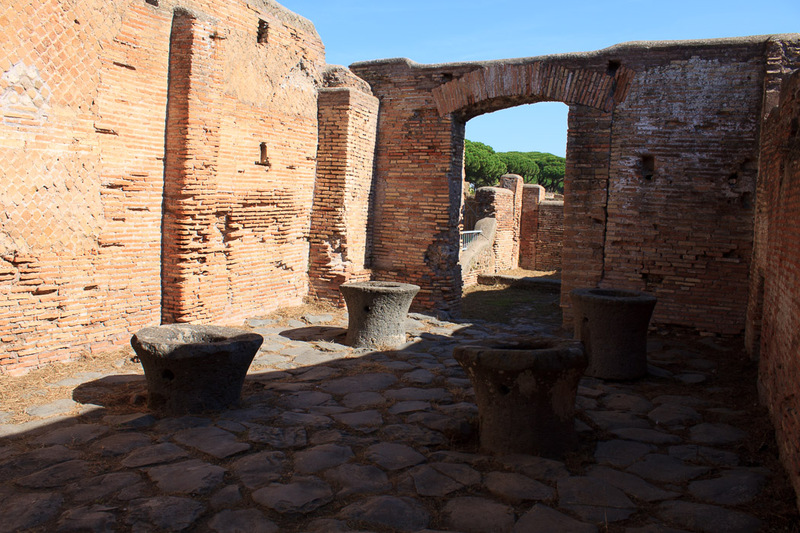 To be honest, I couldn't make much out of these baths; it's really just the foundations of a maze of rooms. 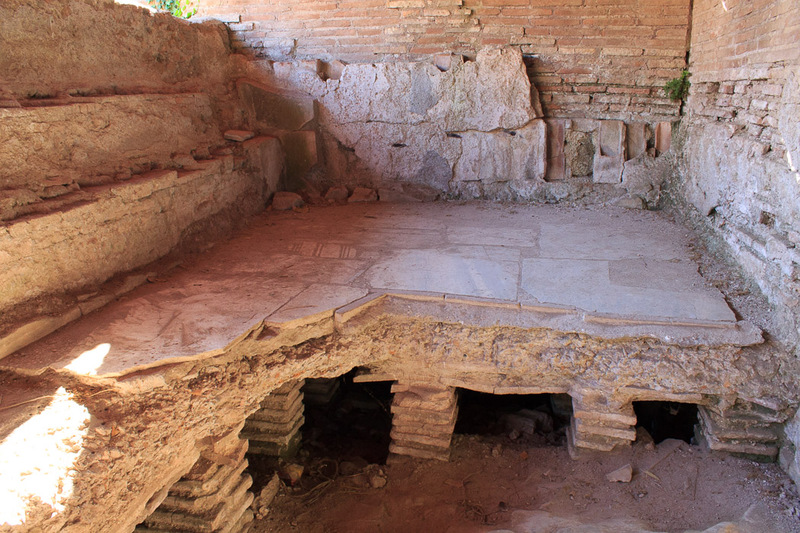 But there's a great mosaic floor in the baths (2nd photo below). 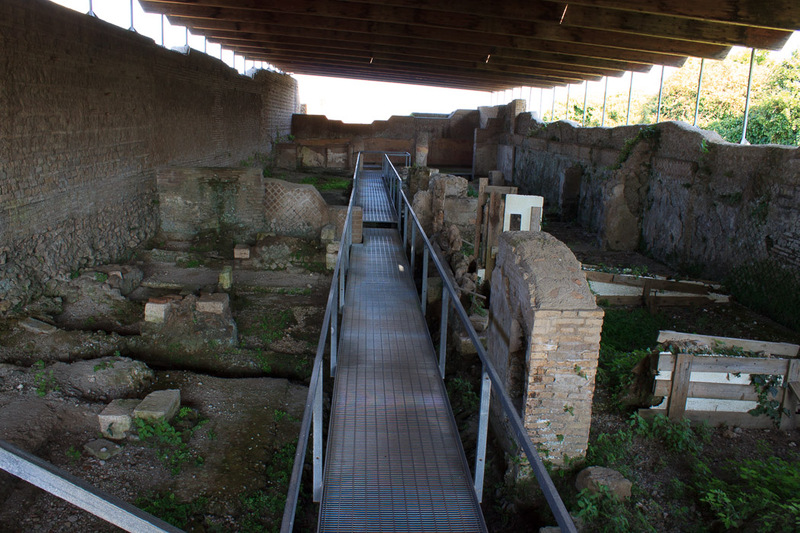 Notice that there are no barricades, fences, or ribbons blocking access to the baths, or even the mosaic. 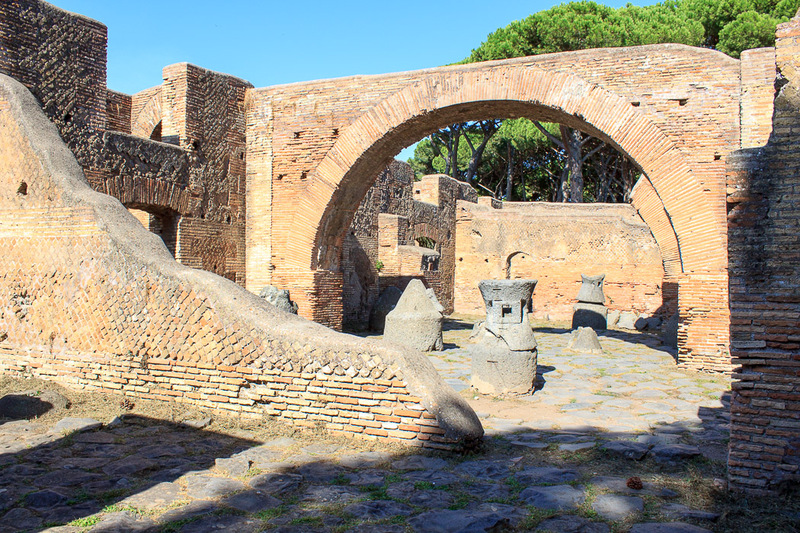 That's the way things typically are in Ostia Antica, it's up to you to help protect the ruins. 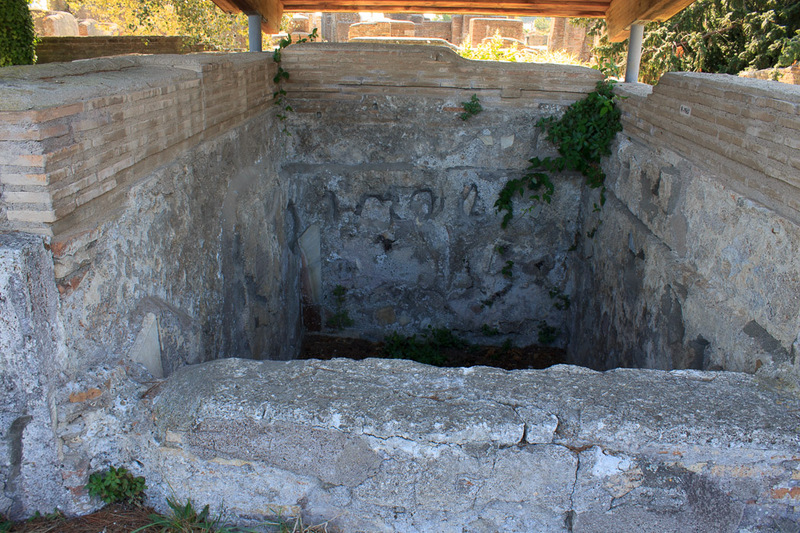 The Baths of Neptune (1st photo below), a bit further down the road, make more sense to me. 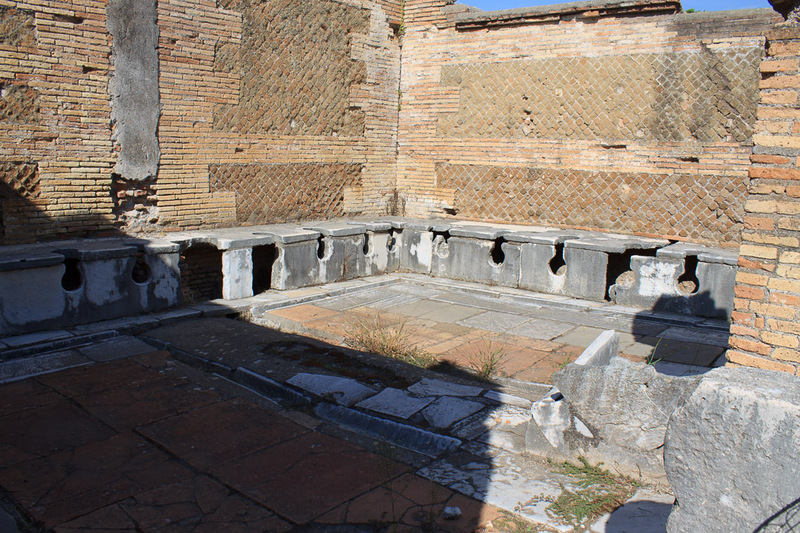 At least these baths have the large rooms laid out in a simple sequence that I associate more with a Roman Bath. 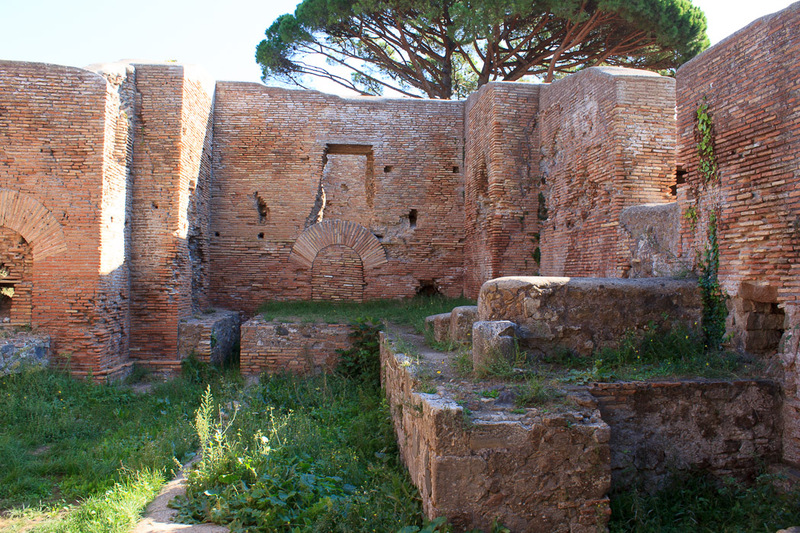 The baths were built by Hadrian and Antoninus Pius. 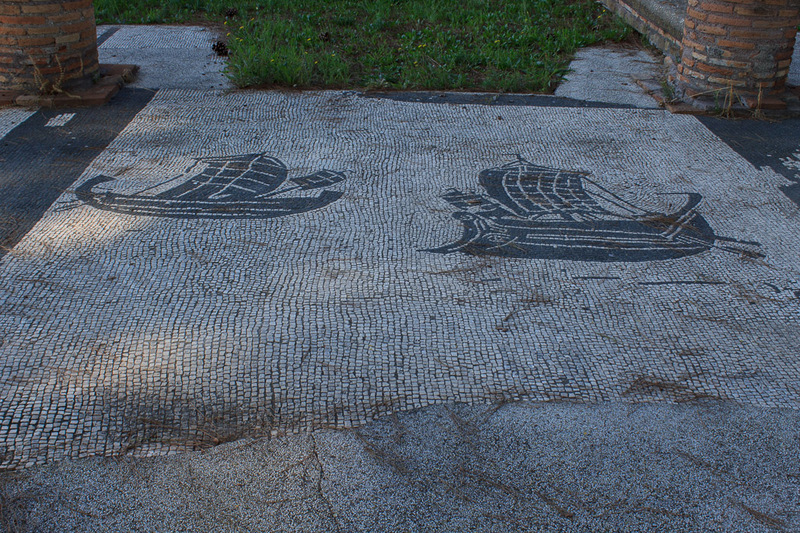 Again, one of the rooms has a tremendous mosaic floor (2nd photo below), this one showing Neptune and his wife Amphitrite. 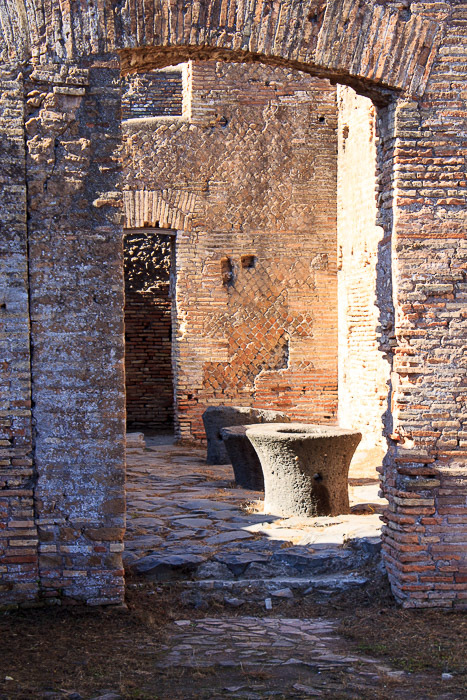 A second-floor terrace in the front part of the building lets you get a good view of the baths and the floor, and that's where these pictures were taken from. 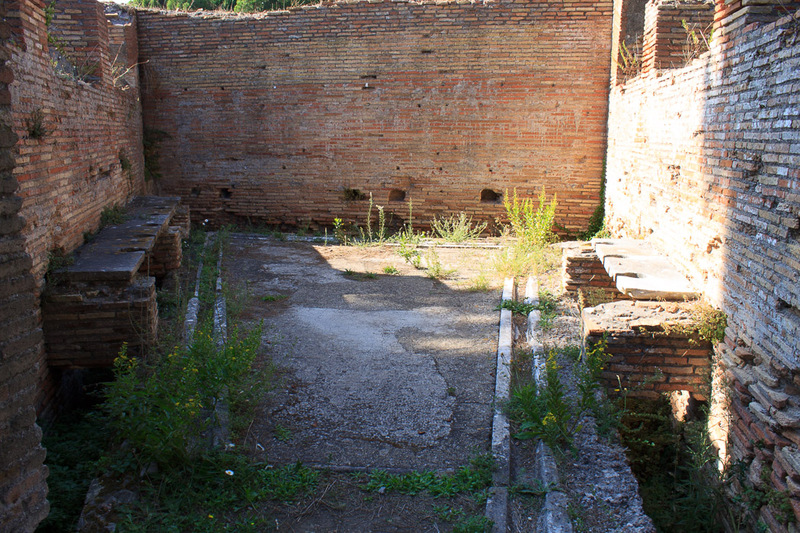 The Barracks of the Fire Brigade (1st photo below) housed 300 firemen in rooms around a courtyard. 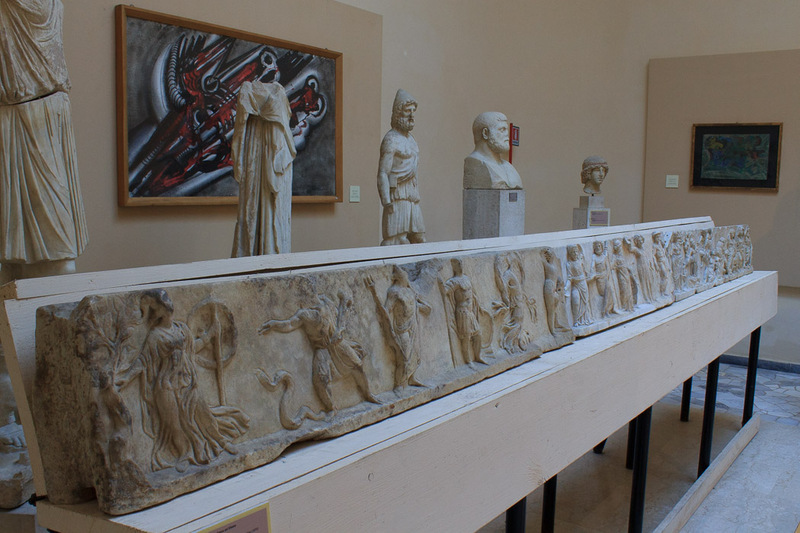 They came from Rome and worked in Ostia for three months at a time. They also worked as a police force and returned runaway slaves to their owners. It looks like the room shown in the 2nd photo below was heated via the spaces under the floor. 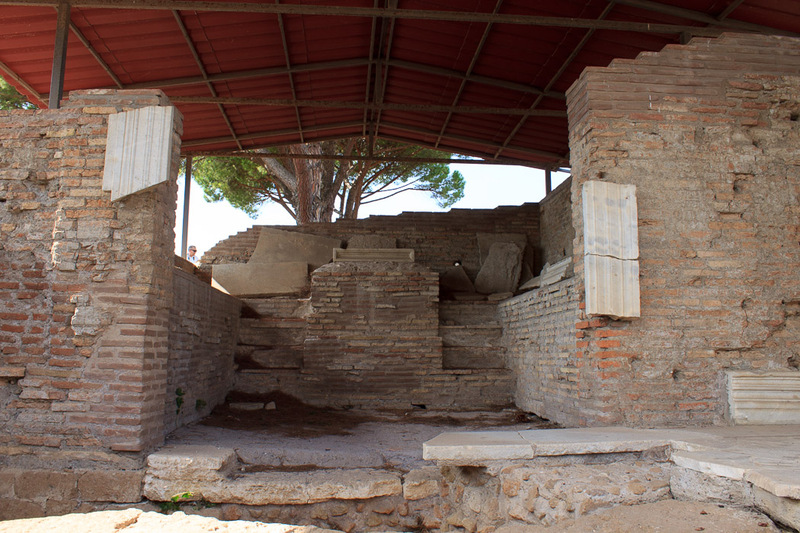 The next building is the large theater, but before you go in, be sure to see the Christian Chapel located just outside. 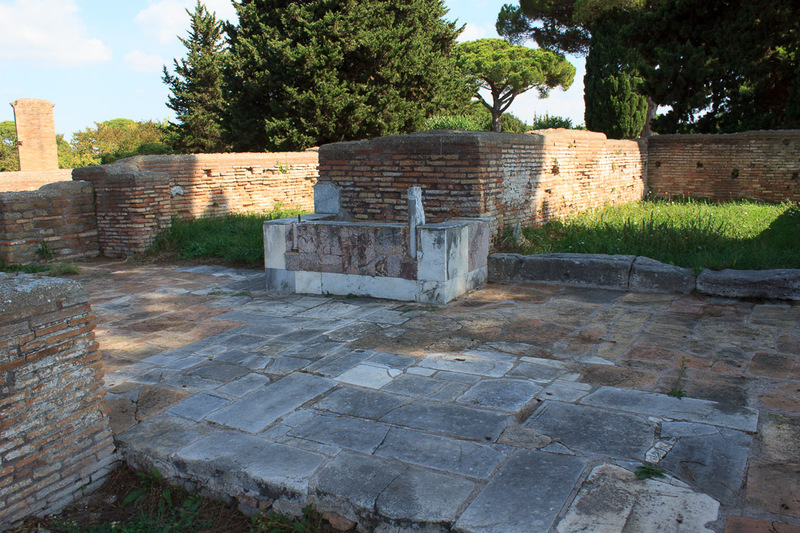 At this spot, Christian martyrs were executed in 269 AD as part of the persecution of Christians before Constantine converted the empire to Christianity. This chapel was subsequently built here. 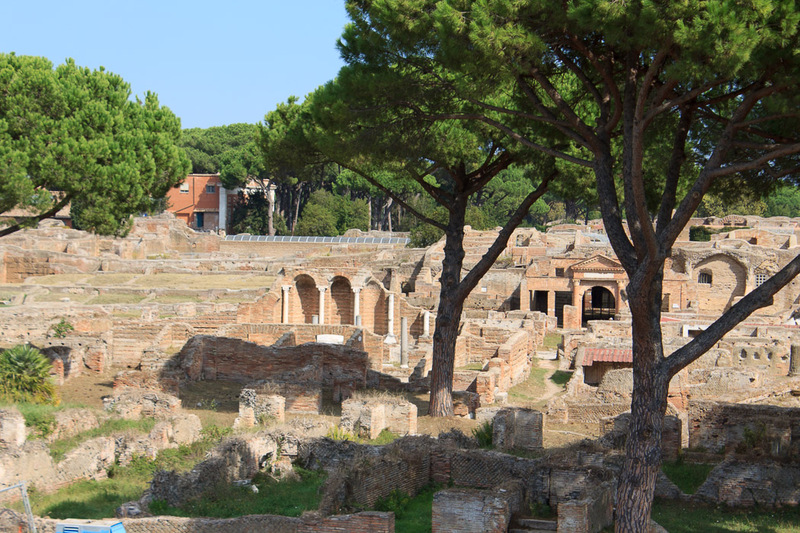 The theater and its surroundings are high-points of Ostia Antica. 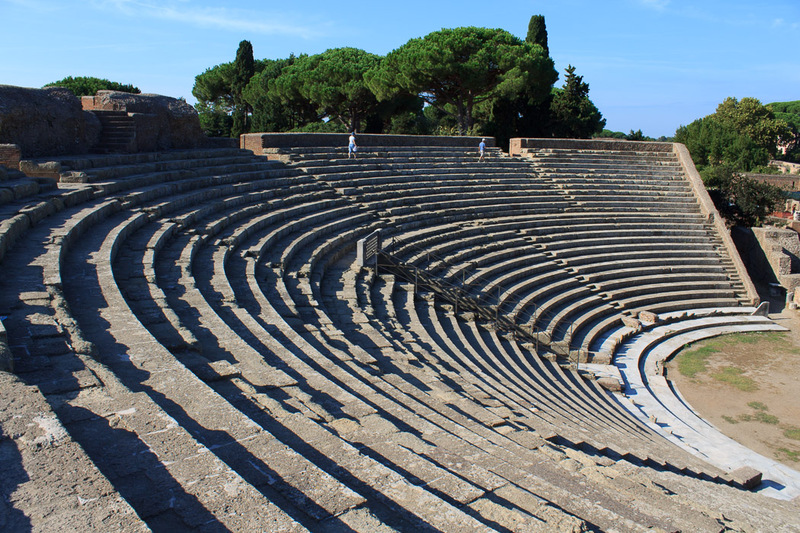 The theater was built in the late first century BC by Agrippa, who you might recall was Augustus' right-hand man. After enlargement it could hold 4000 spectators. 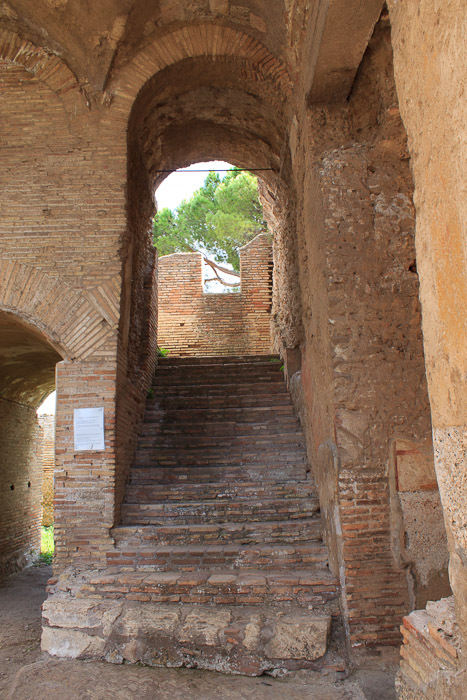 A central corridor leads from the outside of the theater to the lower seats, and stairways lead to the upper seats. 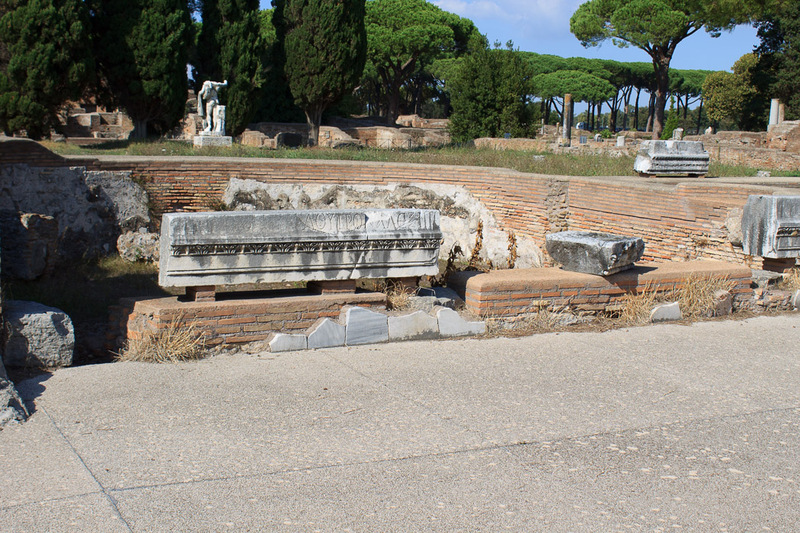 The three front rows are made of marble, and were reserved for the elite. Uppermore rows were for men, with slaves and women at the top. The screen behind the stage is now completely gone, so you don't get the feel of a closed-in theater, but that's the way it used to be. 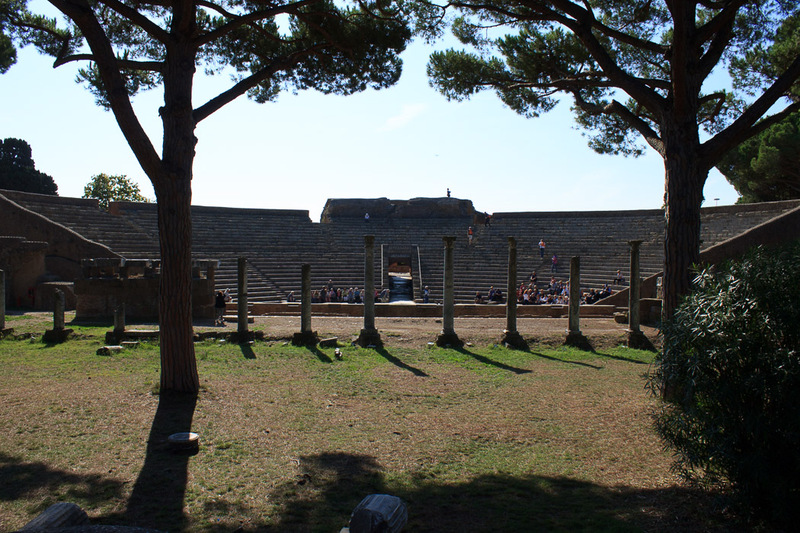 The Plaza of the Guilds is large square behind the theater, in back of the stage. 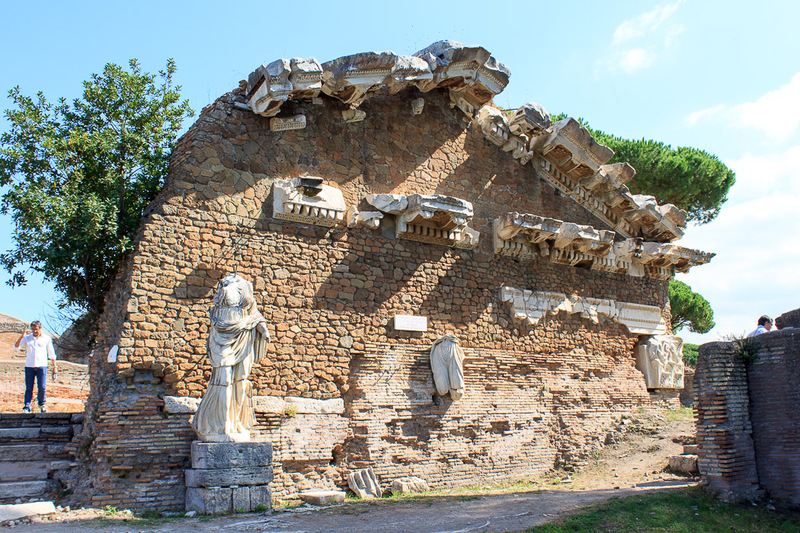 In ancient times it was separated from the theater by a wall behind the stage. 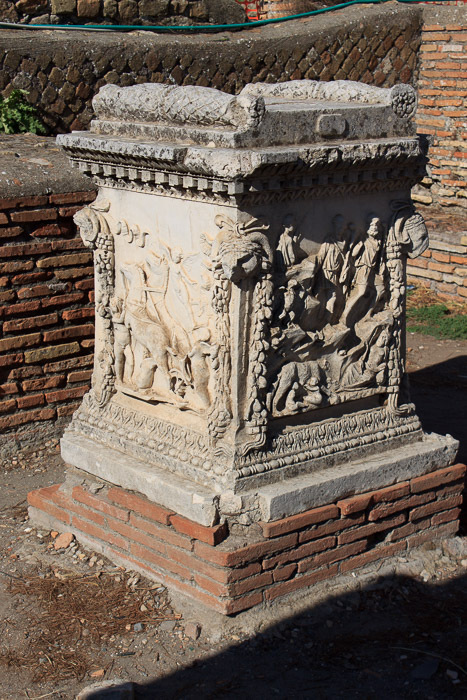 In the center of the square is a temple (2nd photo below) dedicated to Ceres, god of harvest and prosperity. 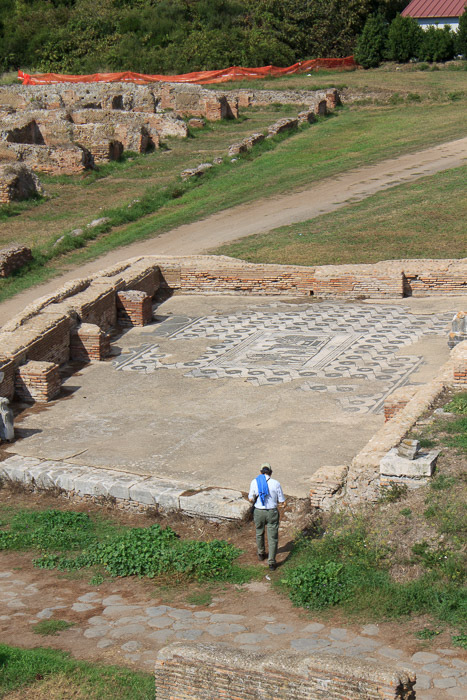 The plaza is surrounded on three sides by small stalls, each with a mosaic floor. One side is shown in the terrible 1st photo below. 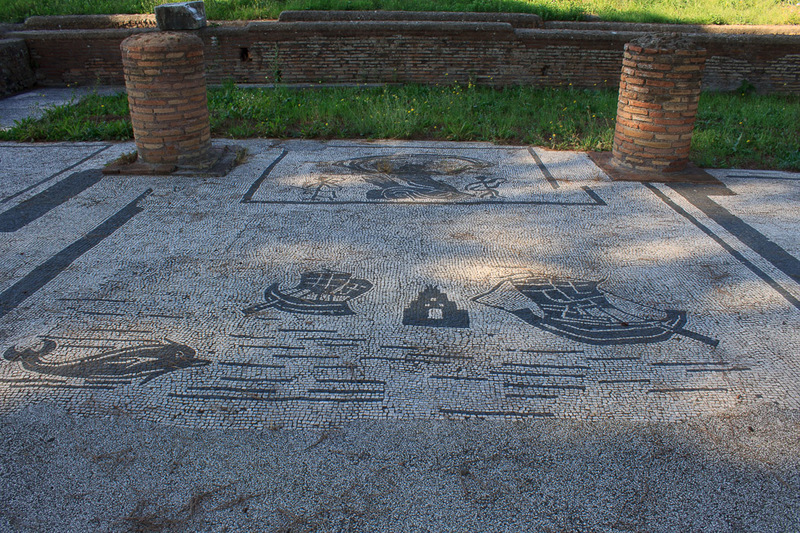 The mosaic floor in each stall is unique, representing the services offered by the particular captain, ship owner, or trader, whose stall this was. 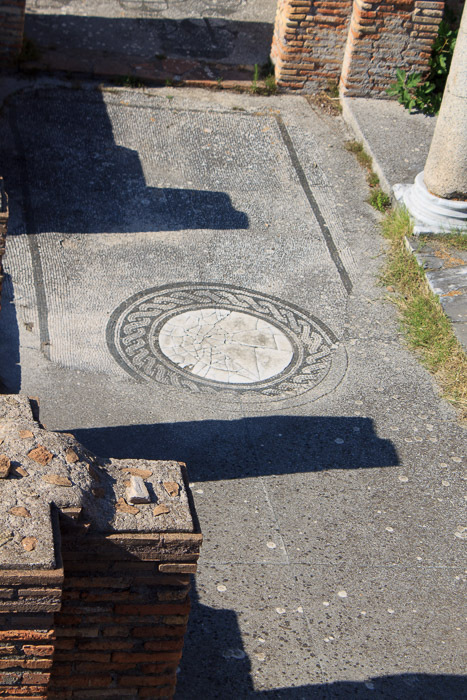 Pictograms were used in addition to Latin words. An elephant might represent ivory trade. 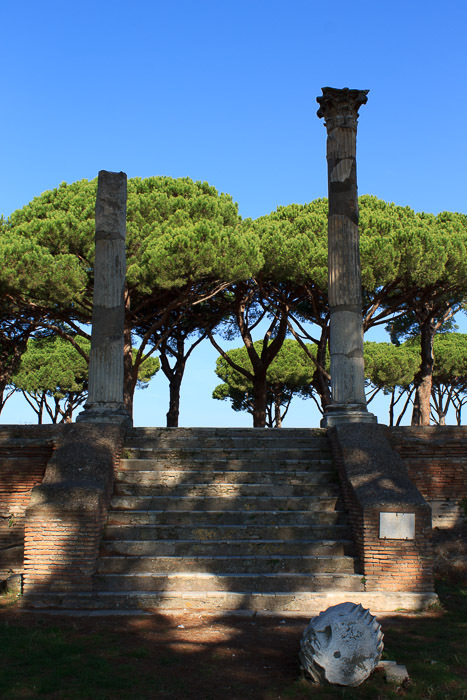 Several show grain measurement, since the import of grain from Africa into Rome was one of the most important businesses in Ostia Antica. 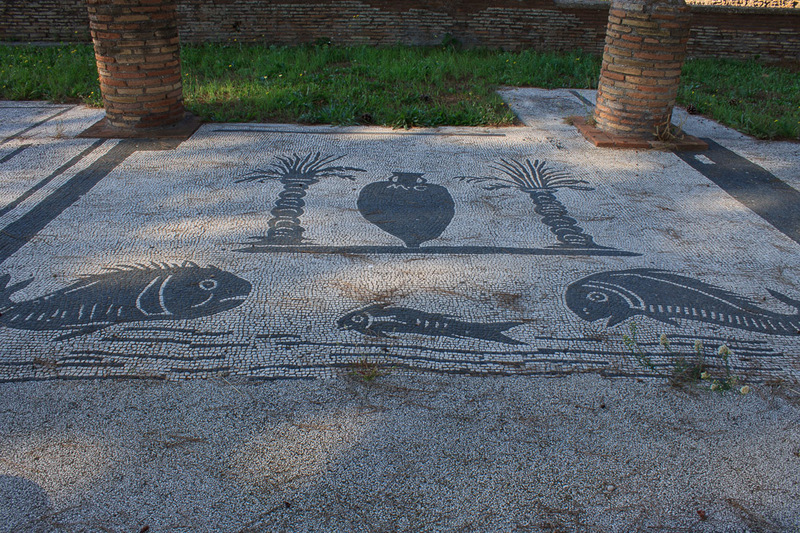 Photos of a few mosaics are follow those first two photos, followed by more photos of the Plaza of the Guilds. 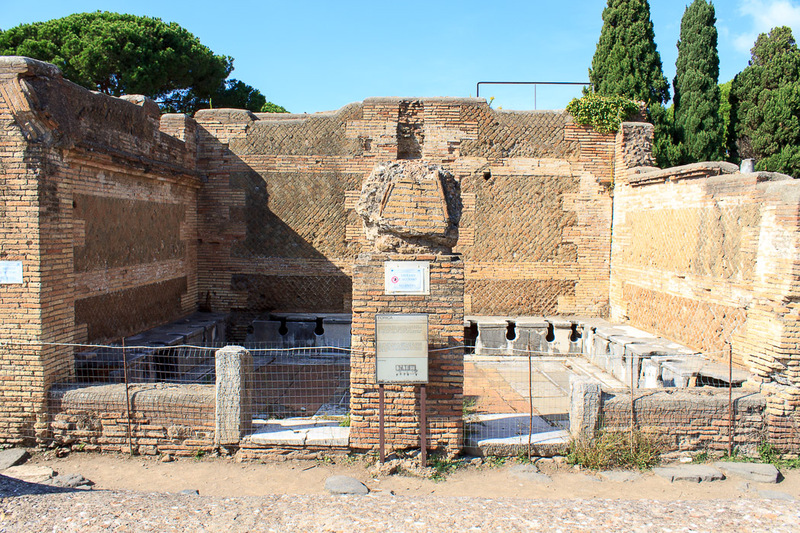 Next to the Plaza of the Guilds is the small Mithraeum of the Seven Spheres (1st and 2nd photo below), which could have accomodated 32 men on the benches along the side walls as they worshiped in the ancient cult of Mithras. 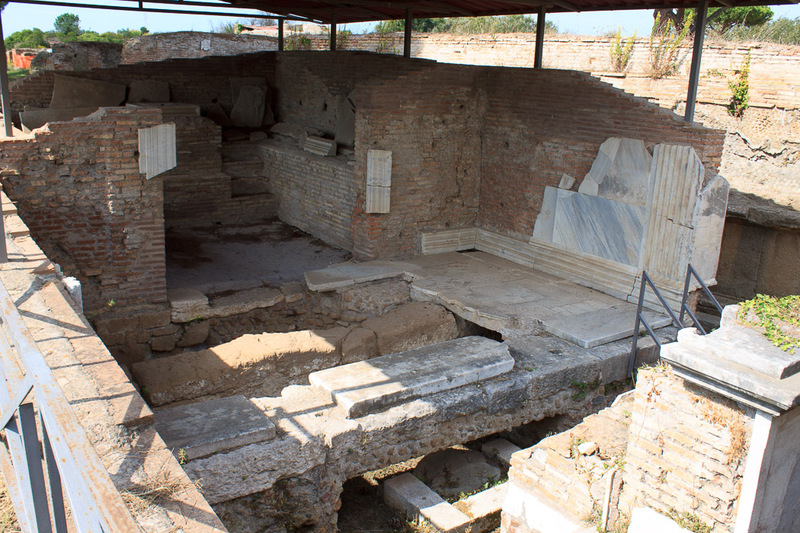 This particular mithraeum is important because mosaics were found here which might help understand the cult. 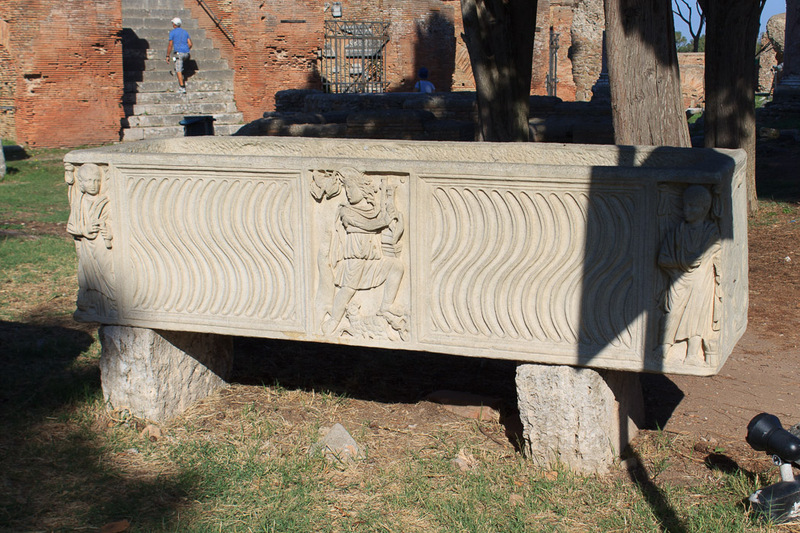 Another mithraeum is nearby, the Mithraeum of the Serpents, shown in the 3rd and 4th photos below. Notice the snake in the 3rd photo below, against the far wall. The 4th photo below was taken through the gap just to the right of that serpent, looking the opposite direction. 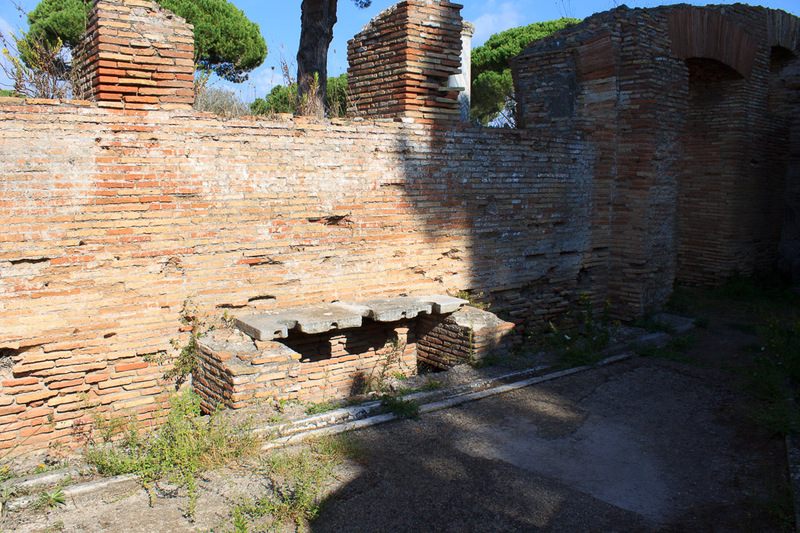 The general pattern of a mithraeum is shown well here: two sets of benches where men sat facing each other, with a leader of the cult speaking from one of the ends. 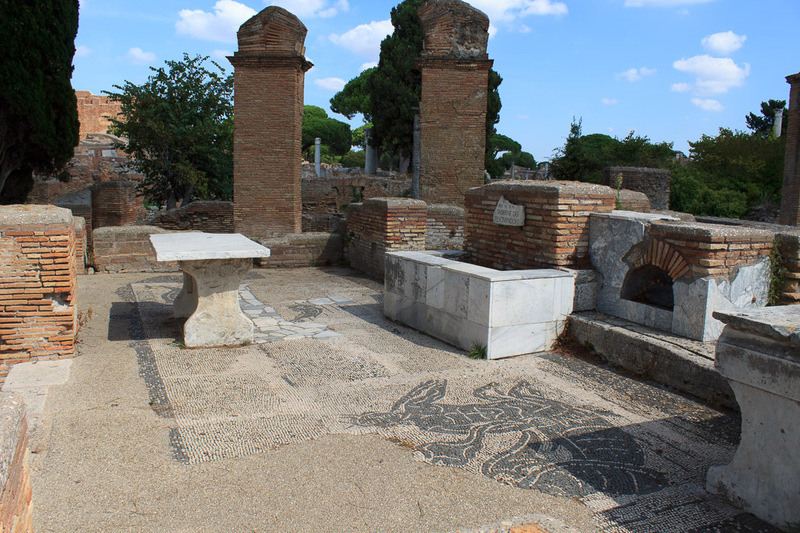 This pattern is evident in several of the mithraeums in Ostia Antica, along with the mithraeum in the underground at San Clemente. 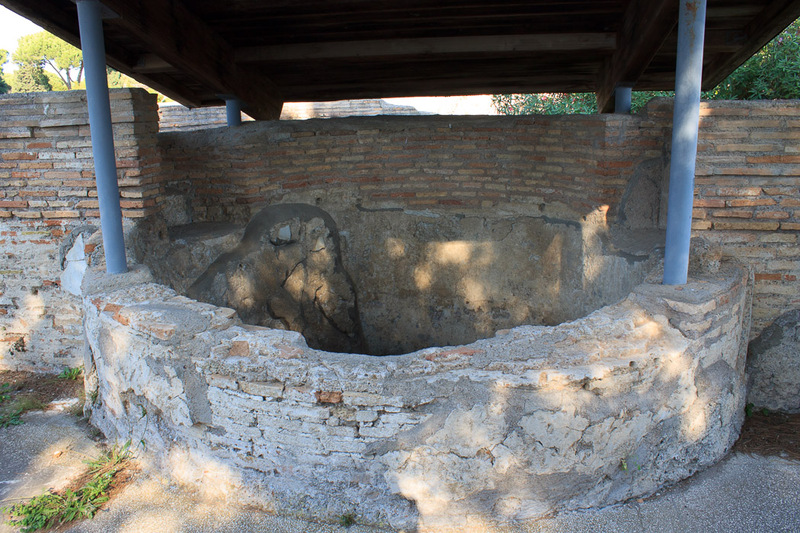 The Mill of Silvanus, or House of the Millstones, was a bakery. The grain-milling machine is best explained using the 1st photo below. There are three machines visible. The left-most one has only the bottom half. It's an immovable cone called a meta. The one in the center shows a somewhat broken hour-glass shaped stone called a catillus on top of the meta. Mules were attached to a wooden frame over the catillus and walked in circles rotating the catillus over the meta. The grain was poured in the top, and the grinding took place betweeen the two parts. The gap between the two parts was carefully maintained to obtain the proper grind. 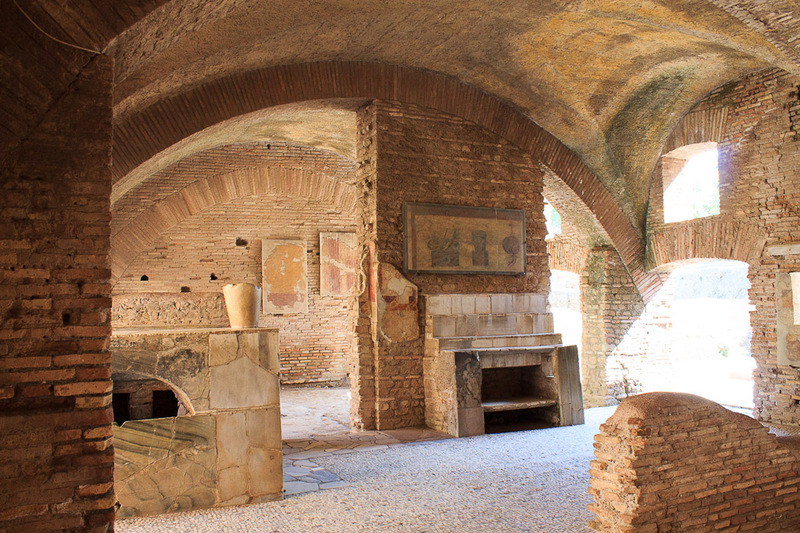 In an adjacent room are kneeding machines, and finally large brick ovens which were fired with wood for baking the bread. 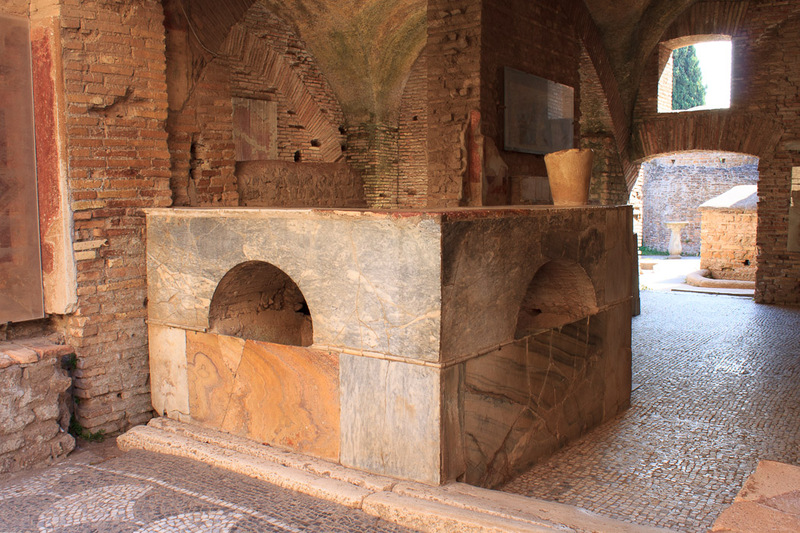 Most of the bread made here was sold at a reduced price, by order of the Emperor. 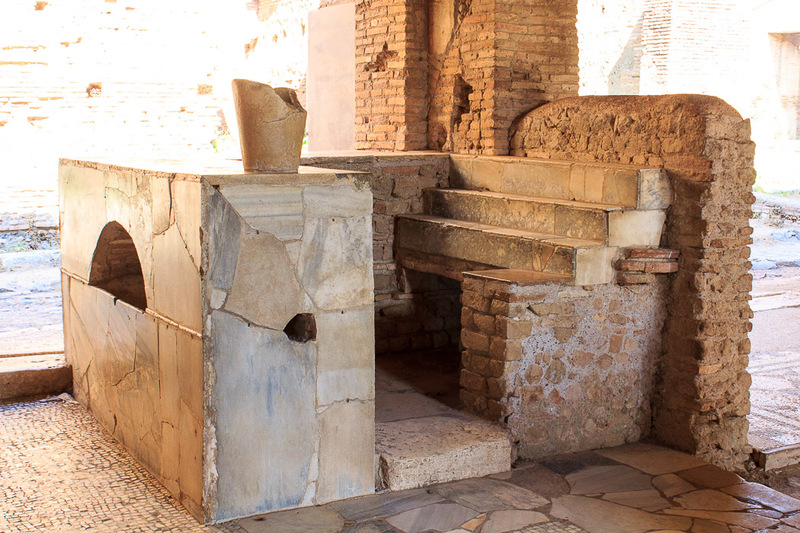 See the Bakery and Mill in Pompeii for more understanding of the Mill of Silvanus. Right after lunch is a fine time to stop off at a wine bar, and there's a superb wine bar nearby. 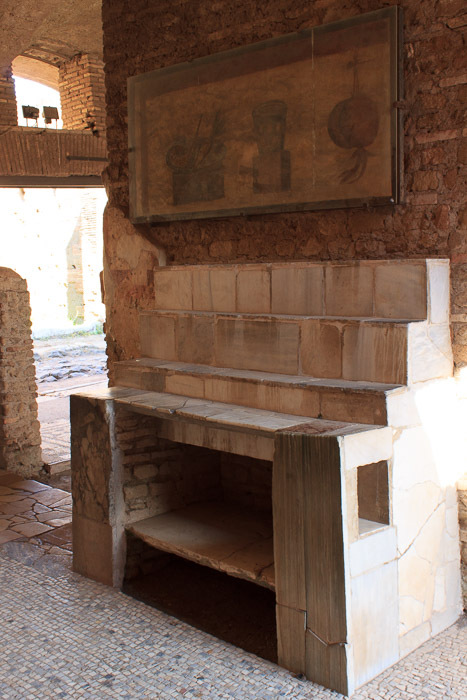 The House of the Wine Bar has a beautiful L-shaped wine bar (1st photo below), with three shelves behind the bartender to hold beakers or glasses. The same bar is shown from the front in the 2nd photo below. Other views of the House of the Wine-bar follow. 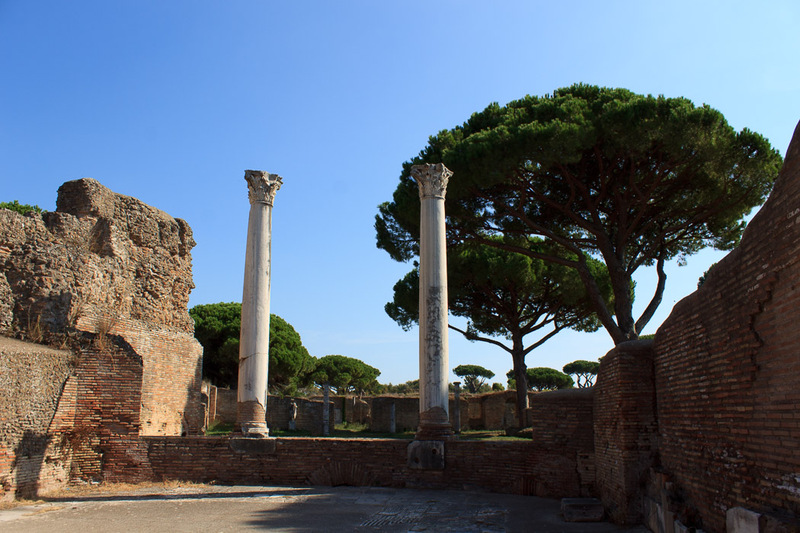 The Capitolium (1st photo below) dominates the Forum, which is the main square of Ostia Antica. 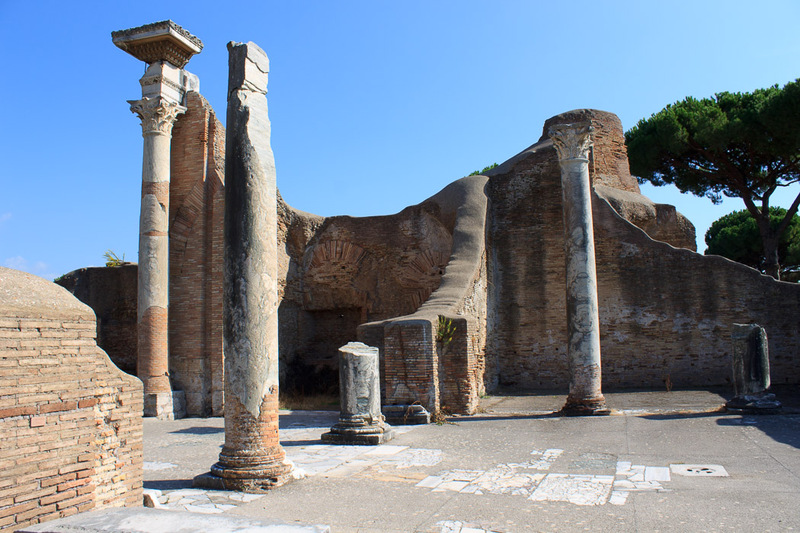 It is a temple dedicated to the main Roman deities, the Capitoline triad (Jupiter, Juno and Minerva), following the example of the Temple of Jupiter Capitolinus on the Capitoline Hill in Rome. 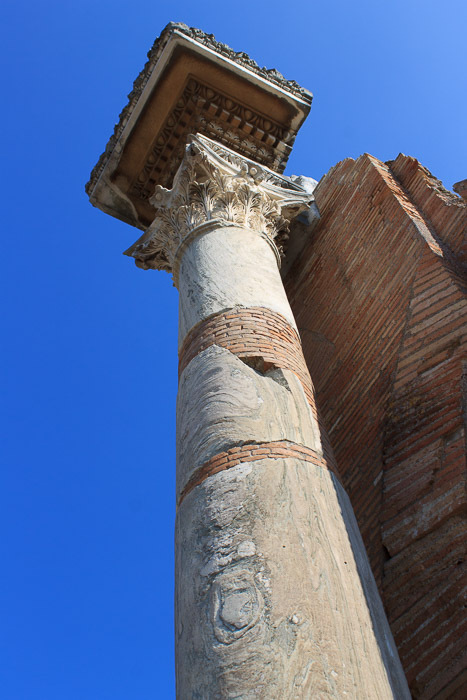 A Forum dominated by a Capitolium temple was a standard feature of colonies throughout the Roman empire. 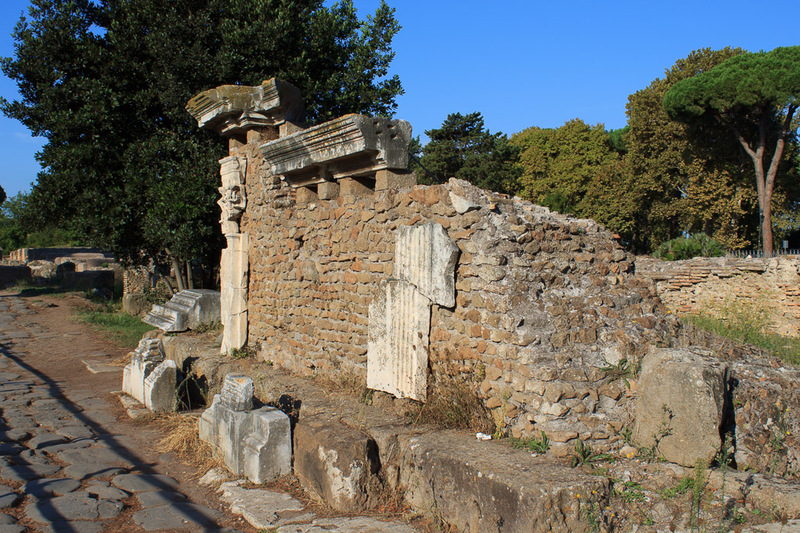 This temple was built by Hadrian. 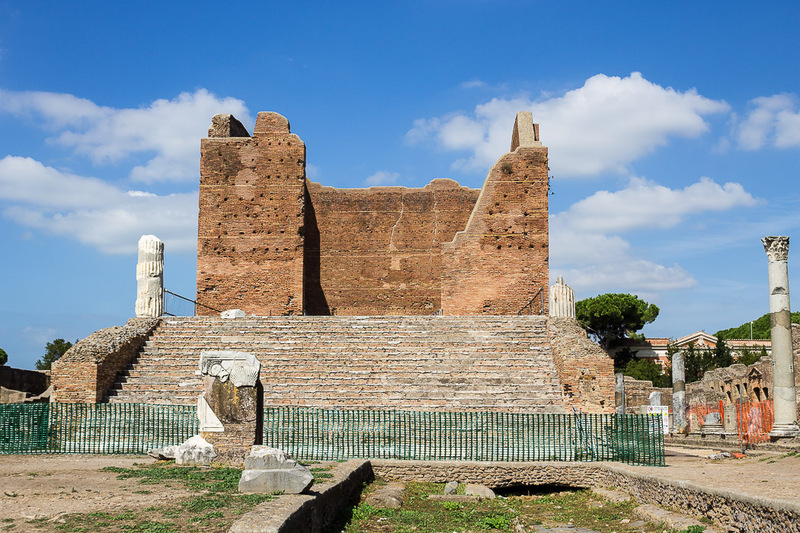 On the opposite side of the Forum square is another temple, the Temple of Rome and Augustus (2nd photo below). 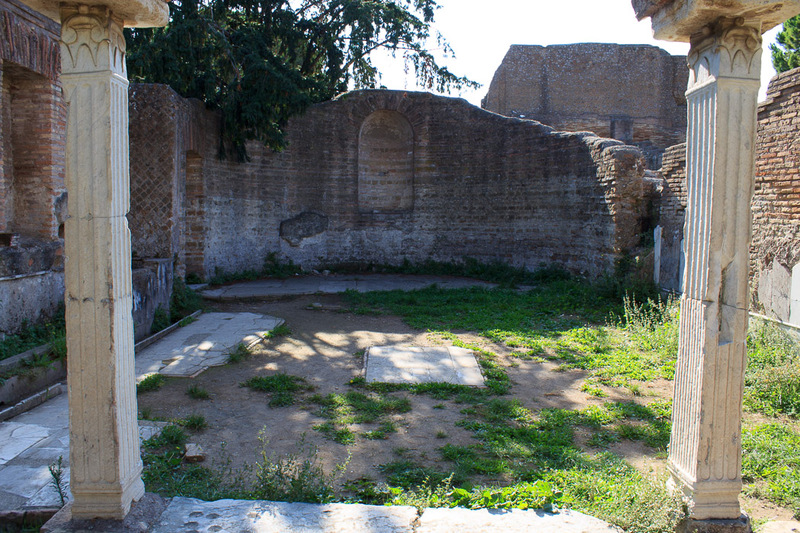 The Curia (senate house) is also on the Forum square, but little remains of it (3rd photo below). 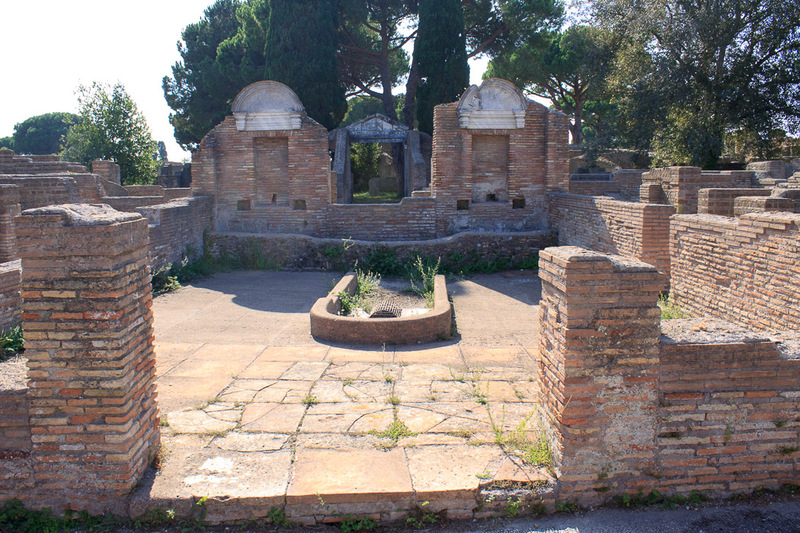 The small round building (4th photo below) at the center of the Forum was a fountain, not a shrine as the sign says. 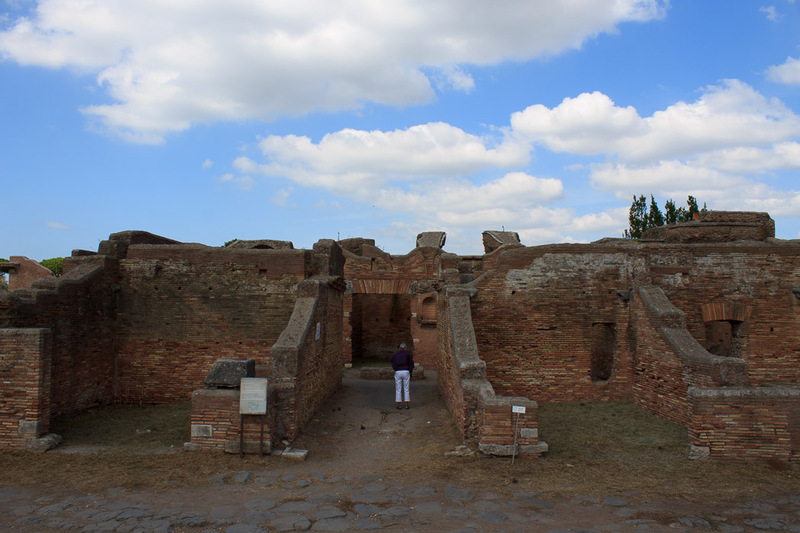 Nearby is a Round Temple, for which only the raised podium and entry stairway still exist (5th photo below). 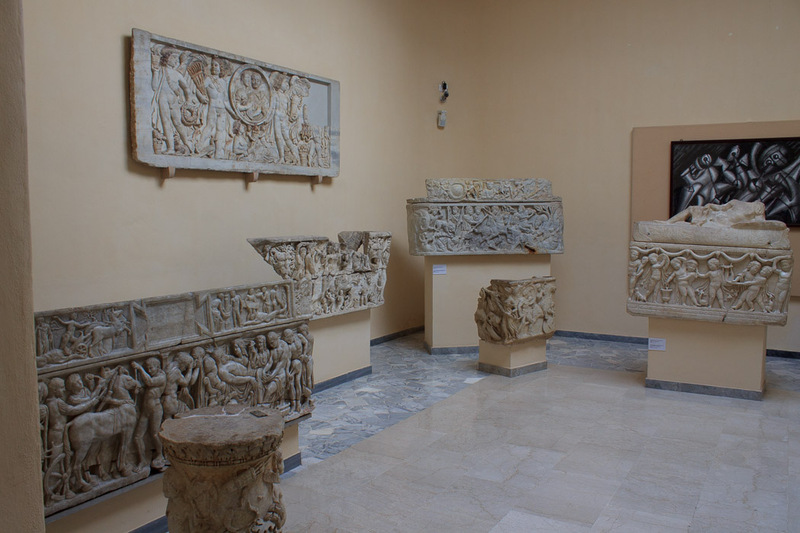 The House of the Cult-niche is a small shopping mall, named after a statue of a deity in a niche. The ground floor has some shops facing the street (1st photo below) and others in a courtyard (2nd photo below). At the intersection of five streets is the House of the Fishmongers. Fish could be bought here from two shops. 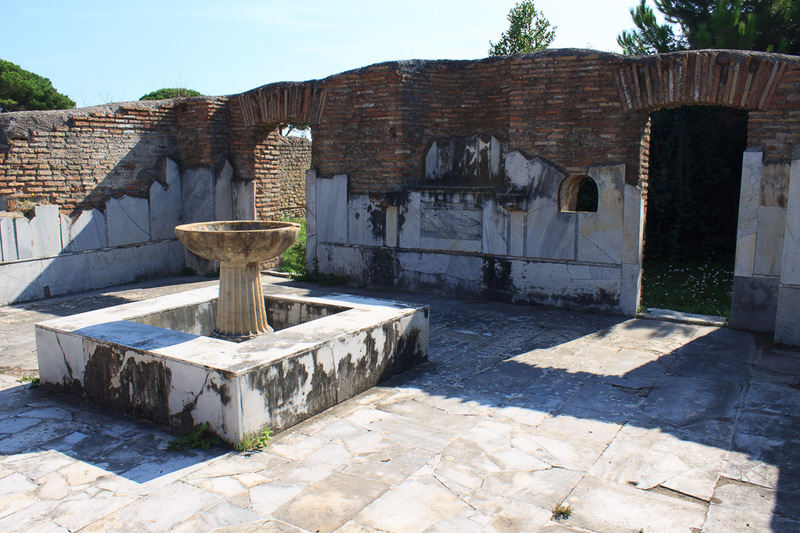 In the center of both shops is a marble table, and against the back wall is a fish basin. 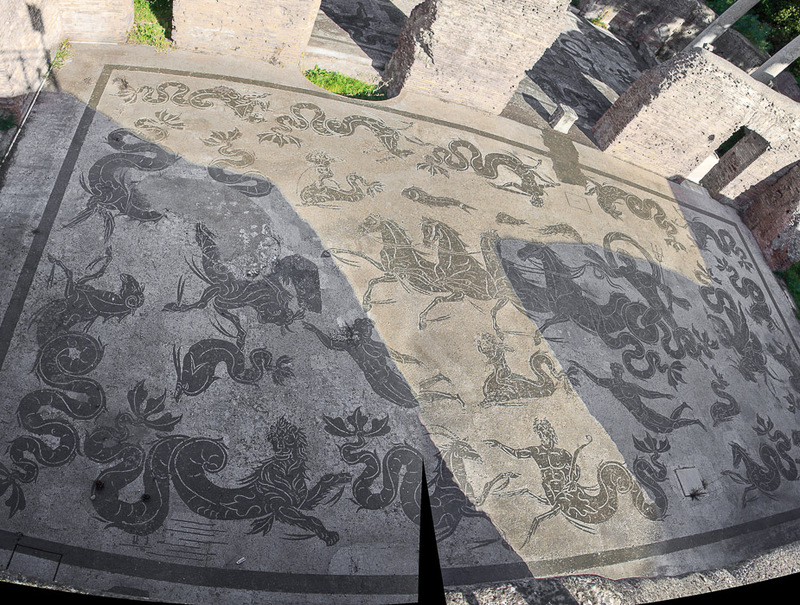 The eastern of the two shops (1st photo below) has a black-and-white mosaic (2nd photo below) with a triton and a dolphin with an octopus in its mouth and the text INBIDE CALCO TE (Envious one, I tread on you). The western of the two fish markets is shown in the 3rd photo below, and another view of the counter in the eastern one is shown in the 4th photo below. 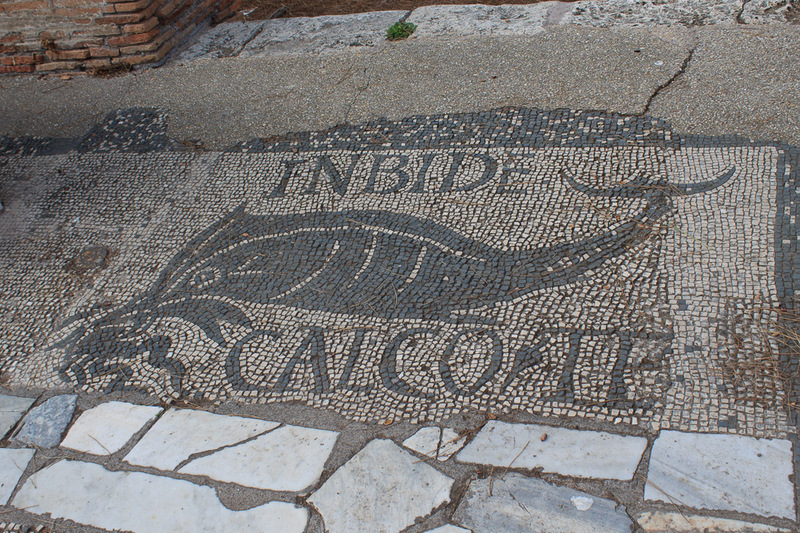 Mosaic in the House of the Fishmongers (eastern shop) in Ostia Antica, "Envious one, I tread on you"
A few minor sights are nearby, for which I have found no descriptions. The Republican Temple (1st photo below) is from, well, Republican times. 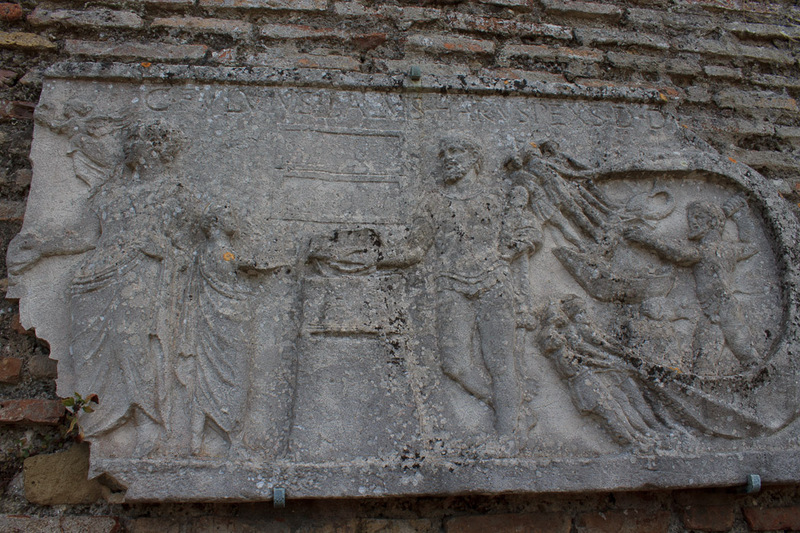 A relief in the Republican Sacred Area is the 2nd photo below. 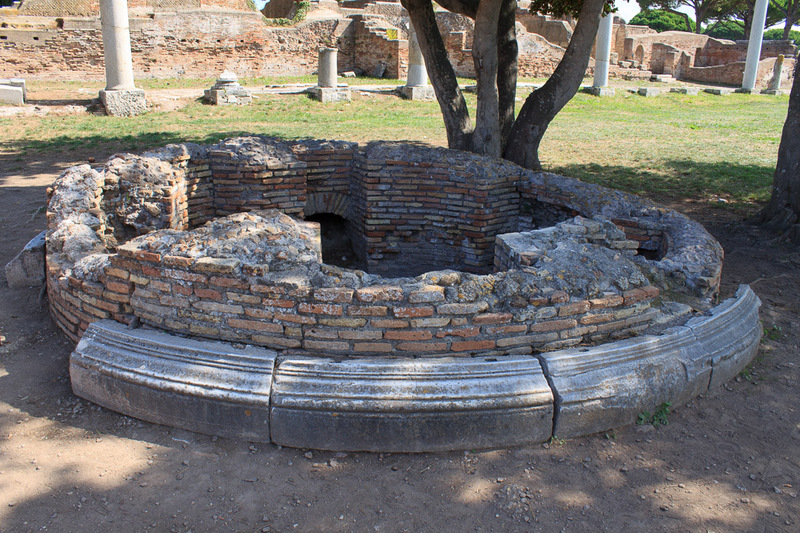 The Temple of the Round Altar (last 3 photos below) is also from the time of the Roman Republic. 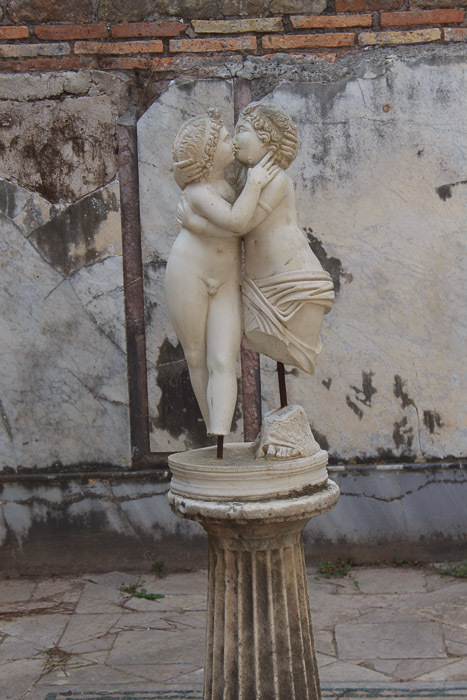 The House of Amour and Psyche was built in the 4th century AD, and was named after the statue of Cupid and Psyche that stands on a pedestal at the center of one of the rooms. 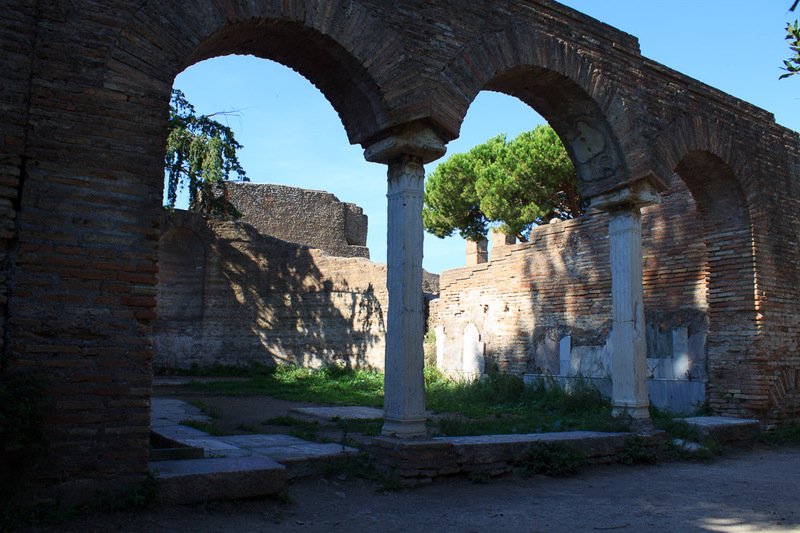 In one room granite columns supported arches made of brick and travertine, and a garden stood behind the arches. 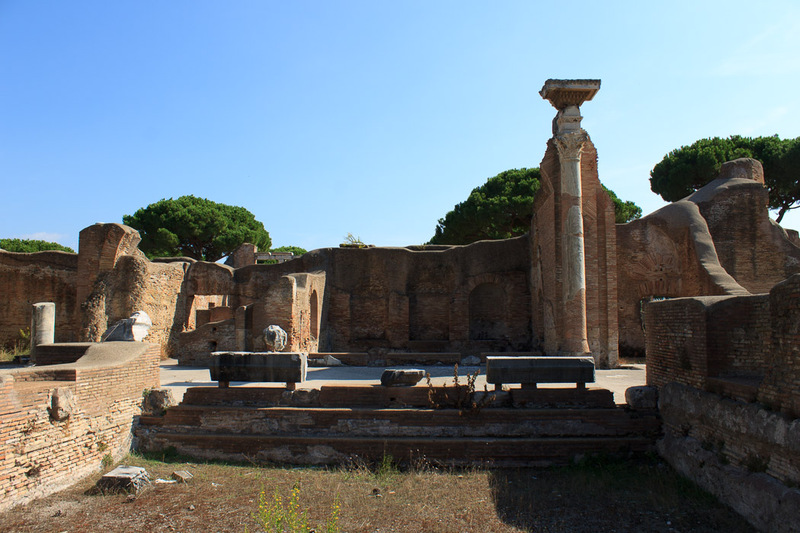 Those granite columns are the ones in the foreground in the 1st photo below, and the garden is between them and the white marble columns, which are part of a nymphaeum. 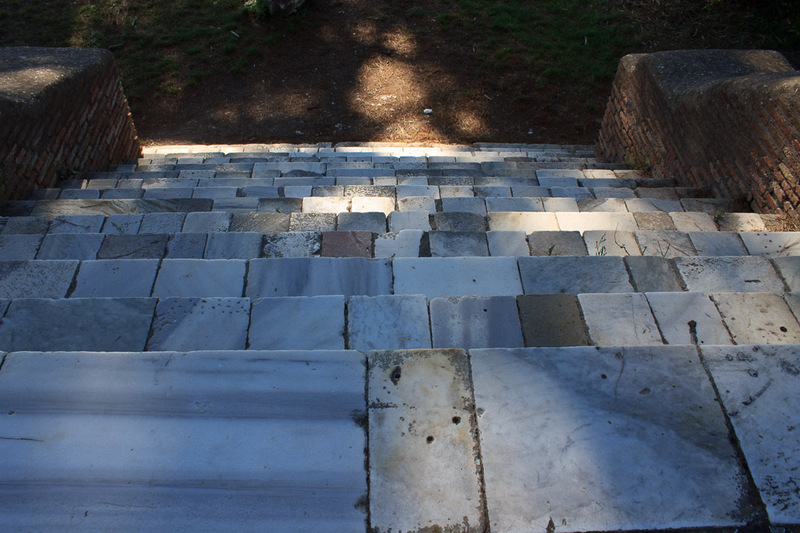 Between the bases of the marble columns are small marble steps, over which water flowed. 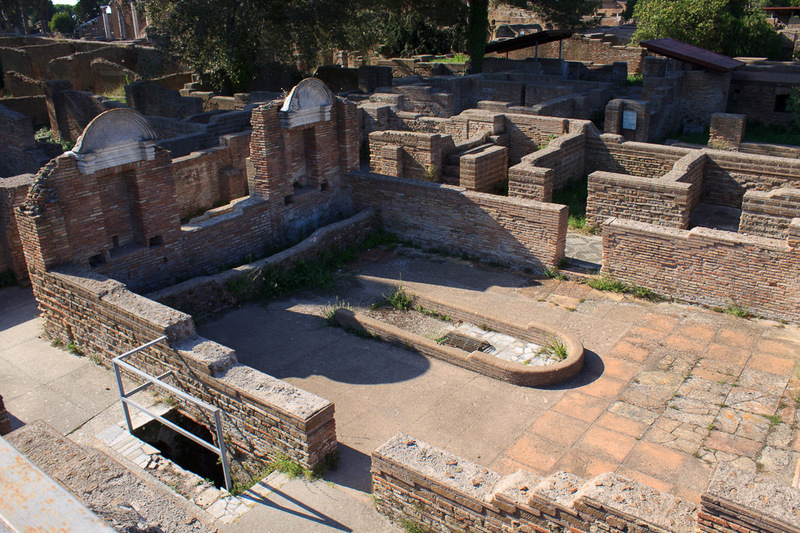 The Baths of Mithras don't actually have very much remaining from the baths, but they do have two interesting features remaining. 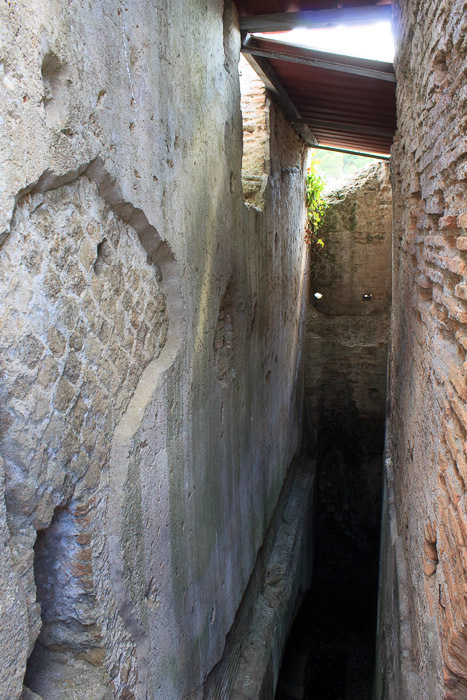 One is a long narrow room (1st and 2nd photos below) for a 24-foot-diameter water wheel which was operated by a slave who constantly climbed rungs along the outer edge of the wheel, thereby driving it to fill 1000 liters per hour of water into an upper cistern which presumably supplied the baths with water. Marks were carved into the wall by the wheel. 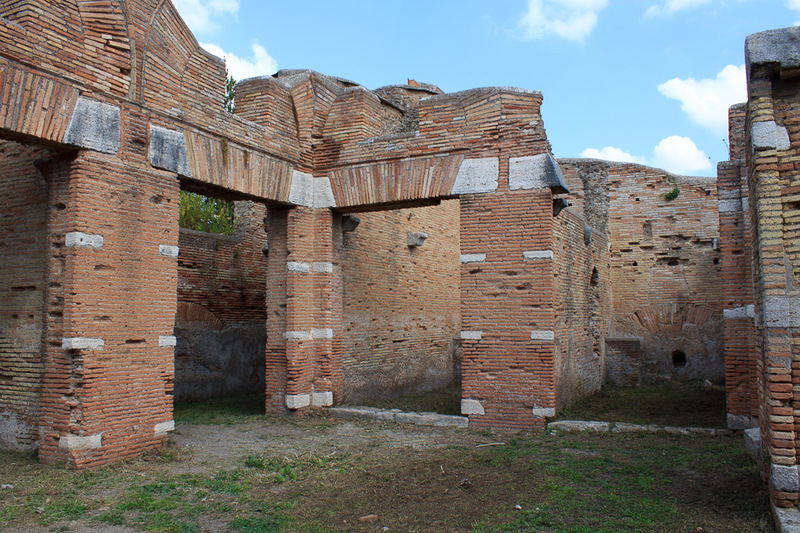 At the other end of the building is a mithraic temple (3rd photo below). 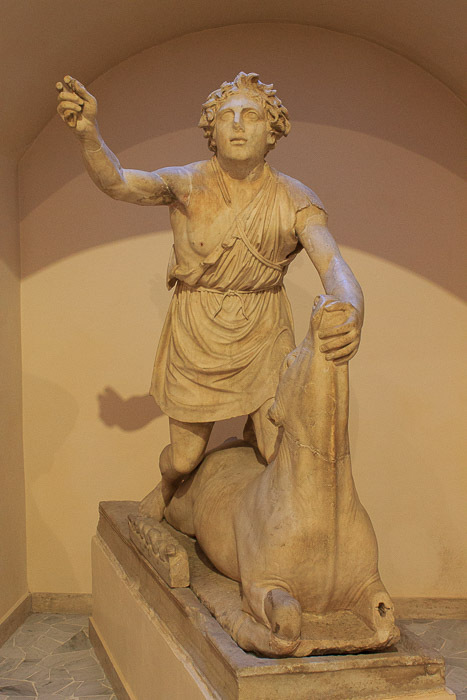 The statue of Mithras about to kill the bull, now in the museum, was originally found in this shrine. 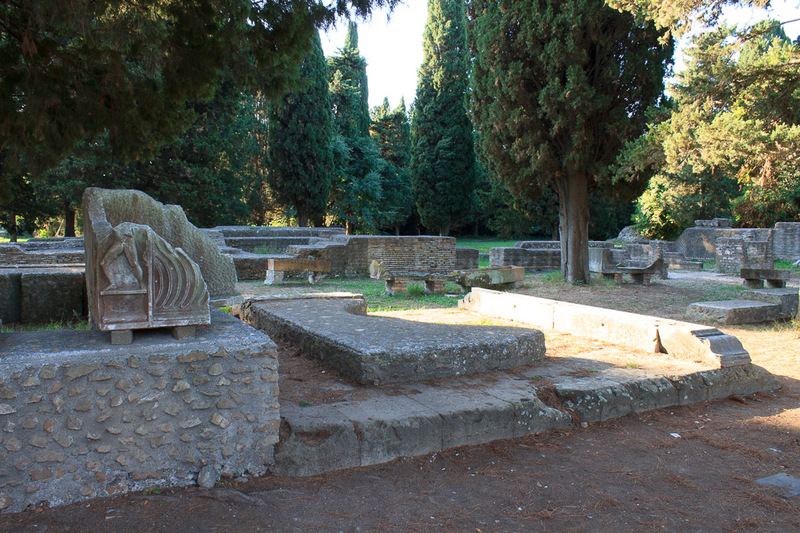 The Guild-seat of the Grain Measures was a temple that was dedicated to Ceres Augusta, whose name is a combination of the the goddess of grain (Ceres) and the worship of the emperors (Augusta). 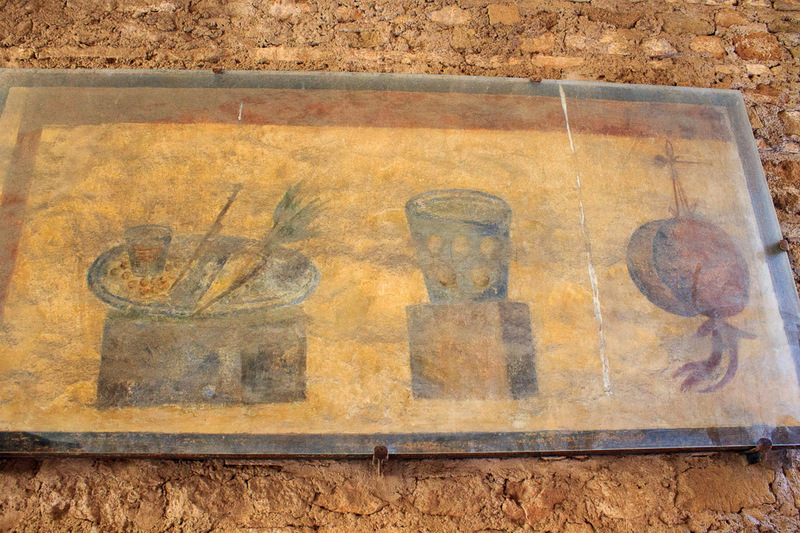 There is a large hall with a mosaic showing grain measurers (1st photo below). 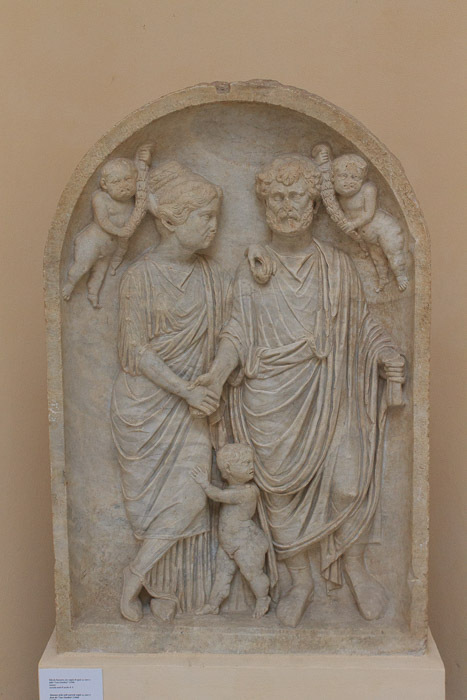 Grain was measured when it arrived in the port from Africa, the breadbasket of Rome; then again when it arrived at the storehouses; and a third time when it was sent to Rome. 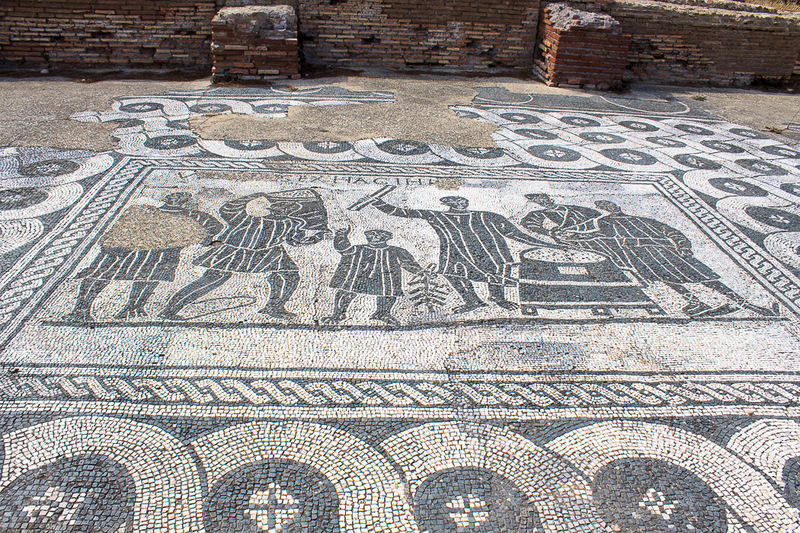 The leftmost person in the mosaic is damaged, the second is carrying a sack with grain, the third might be a slave whose right hand is raised and whose fingers show the number nine. His left hand holds a rope with nine tickets of wood, used to count the number of sacks that had arrived from the harbor. 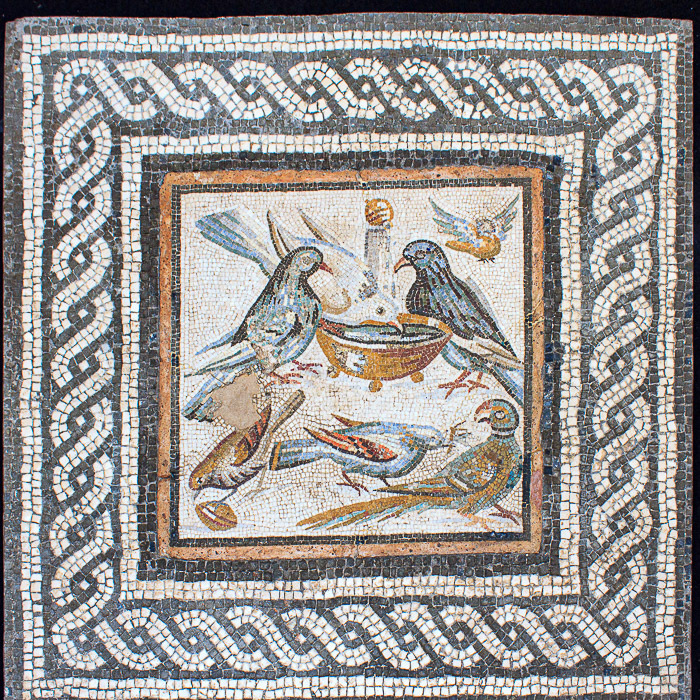 The other three people in the mosaic are gathered around a grain measure. The one on the left is the measurer; the one in the center is a porter who just emptied a sack or is about to take the contents of the measure to a store building. The person on the right indicates 5000 with this right hand, which is equivalent to nine sacks, the number held up by the slave. 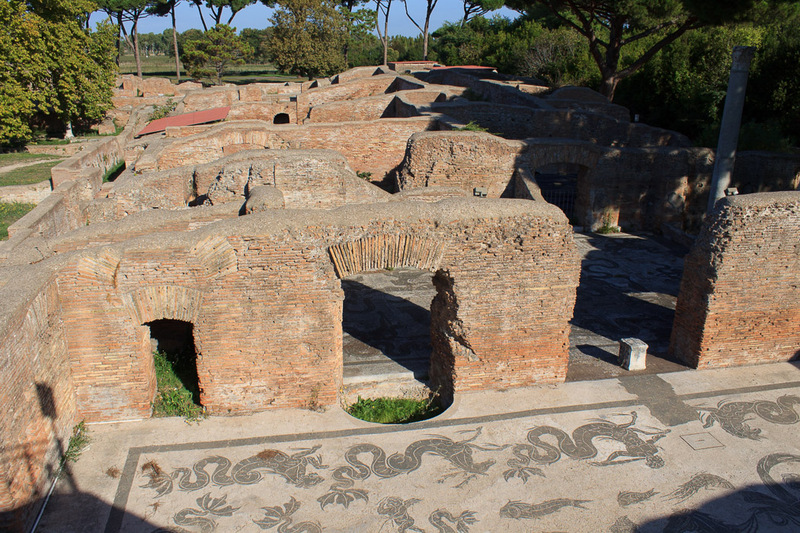 A good view of the entire mosaic can be had from the second floor terrace of the next building. 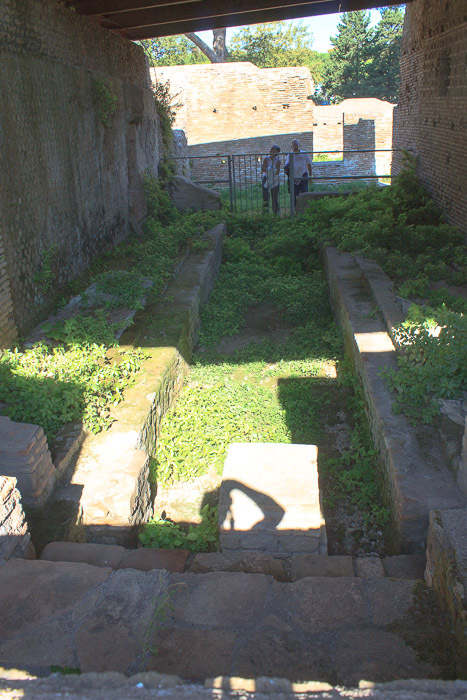 The House of Serapis is a two-story building with shops on the ground floor and apartments on the upper floors (1st photo below). 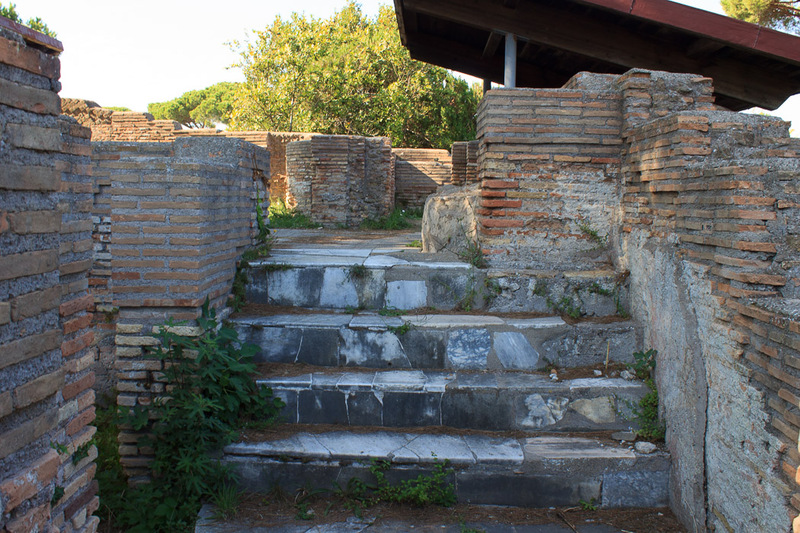 You can today take a stairway (2nd photo below) to a terrace on the upper level and have great views (subsequent photos below) of the ruins of Ostia Antica in this neighborhood. 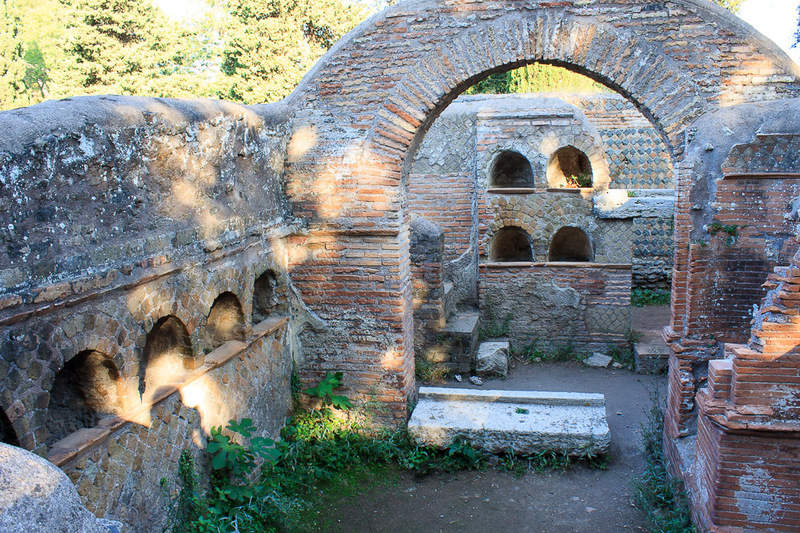 The Baths of the Seven Sages are next to the House of Serapis. 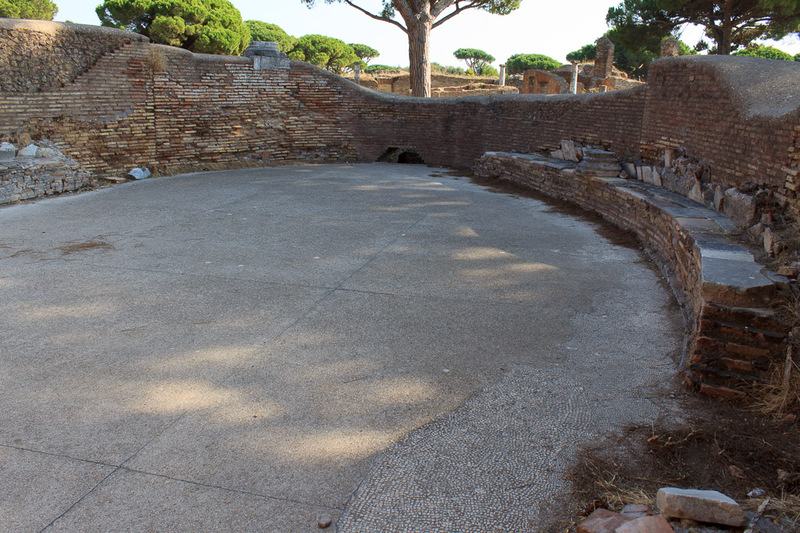 The highlight is a large round hall (1st photo below) which was covered by a cupola in ancient times. 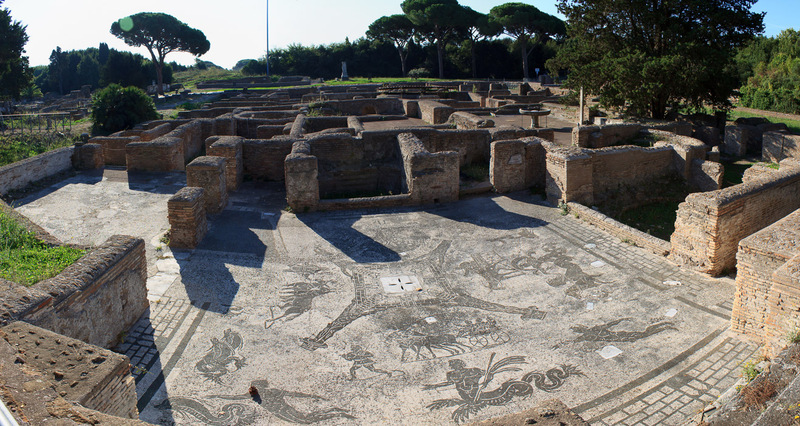 The floor holds a beautiful black-and-white mosaic with a diameter of 39 feet, showing hunting scenes with 15 hunters. 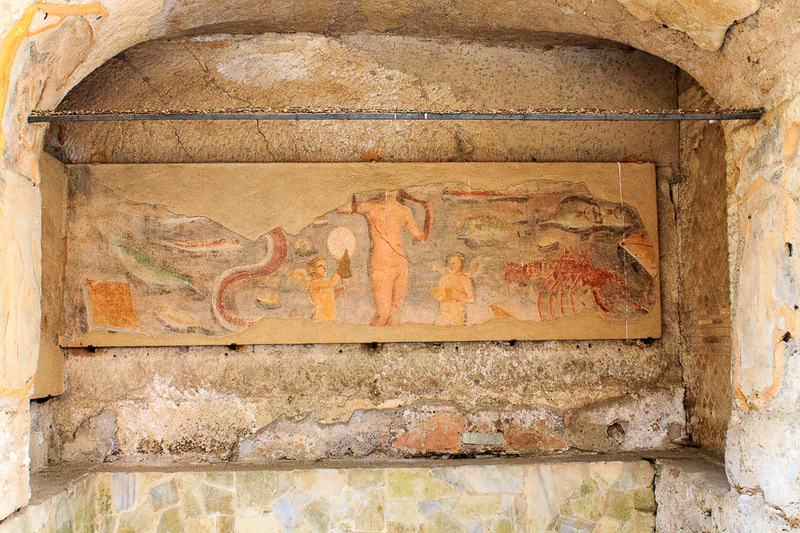 There are several frescoes in the Baths of the Seven Sages, including the one in the 2nd photo below, which might be the best. 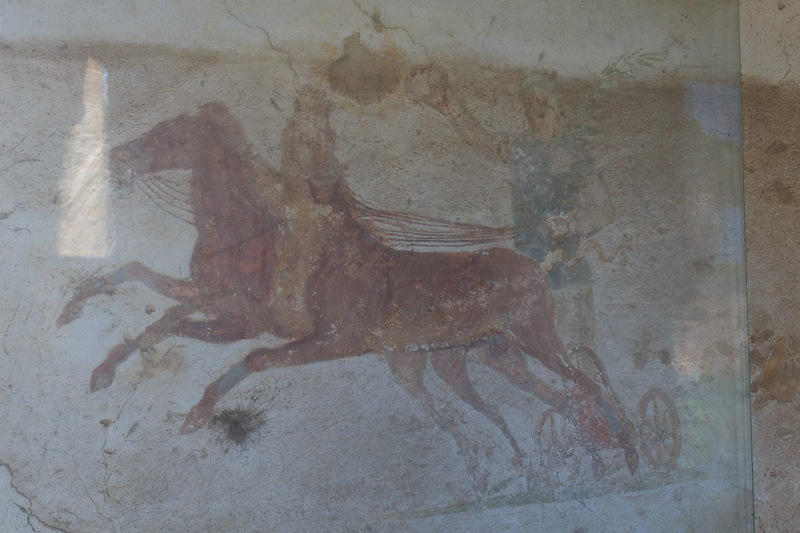 The next building over is the House of the Charioteers, named for frescoes of victorious charioteers, two of which are shown in the 1st and 2nd photos below. 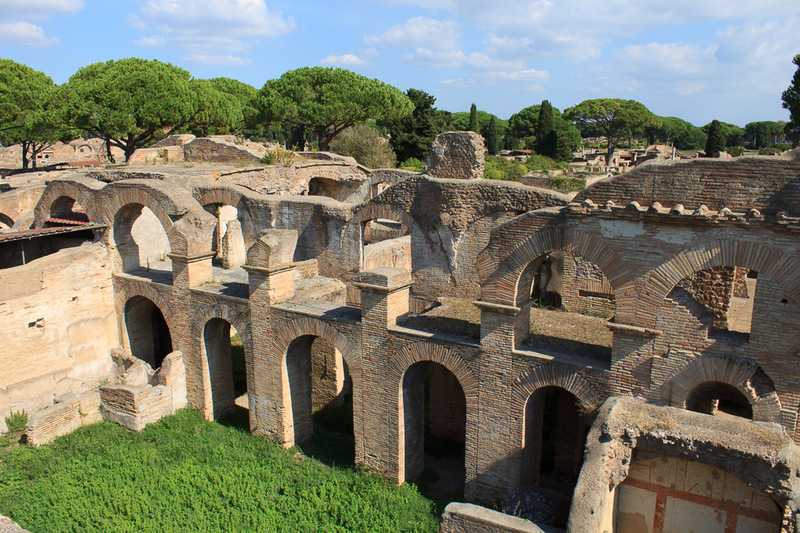 Again, a terrace on the second floor of this house provides a panoramic view of this part of Ostia Antica. 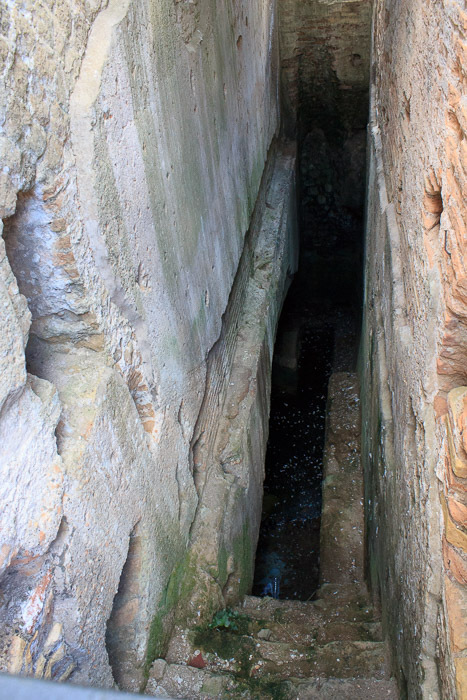 The 3rd photo below shows the Baths of the Seven Sages from this viewpoint, and the 4th photo below shows nearby buildings. 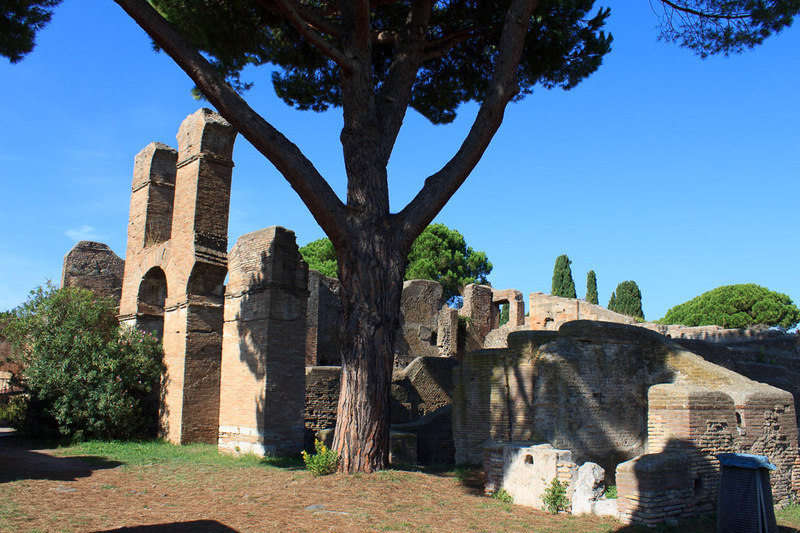 By this point, 5 hours into my day in Ostia Antica, I had nearly run out of energy, plus, the bottom of my backpack had torn so once I noticed this during lunch I wore it upside-down for the rest of the day so my things wouldn't fall out. That's an awkward and uncomfortable way to carry a backpack! 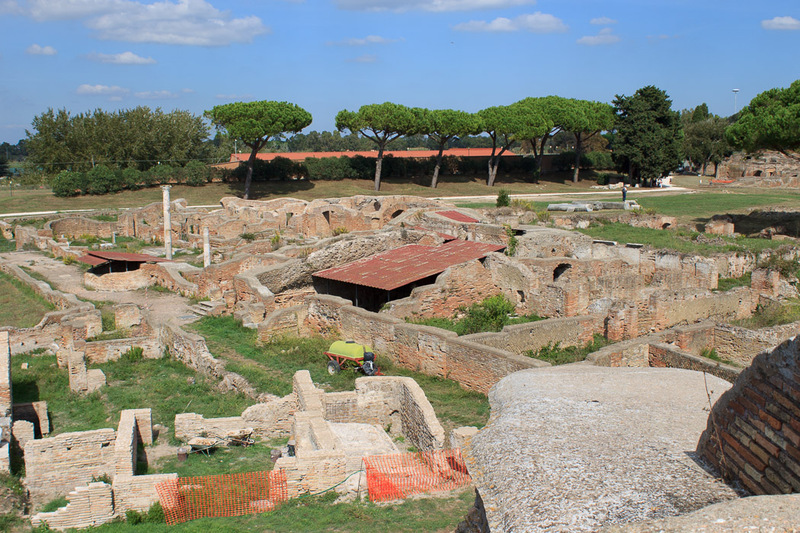 In any case, I decided to not go further to the last few buildings at the eastern end of Ostia Antica, and headed back toward the main part of town on my way to the entrance/exit back at the western end. 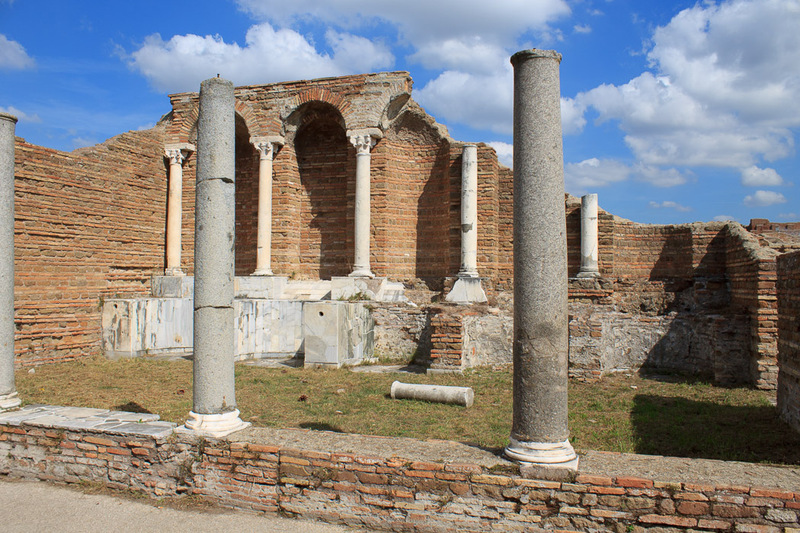 One attraction along the way was this Christian Basilica, shown in both photos below. 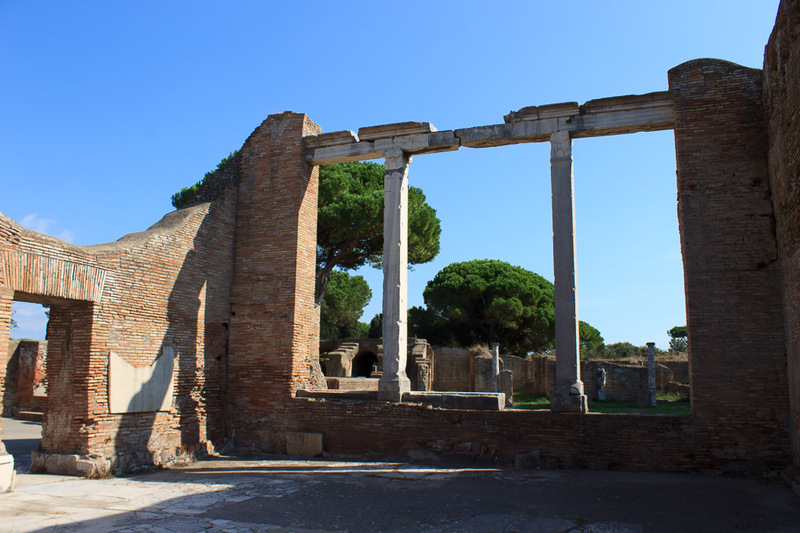 It was a Christian church, and might be the church of Peter, Paul and John the Baptist that was donated to Ostia by Constantine. 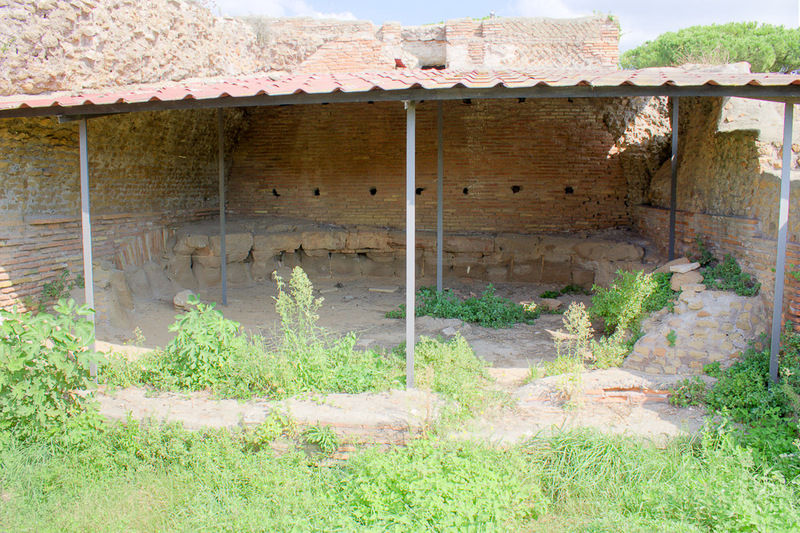 The Horrea Epagathiana and Epaphroditiana was a storage building owned by two freedmen, Epagathus and Epaphroditus. It was built in 145-150 AD. 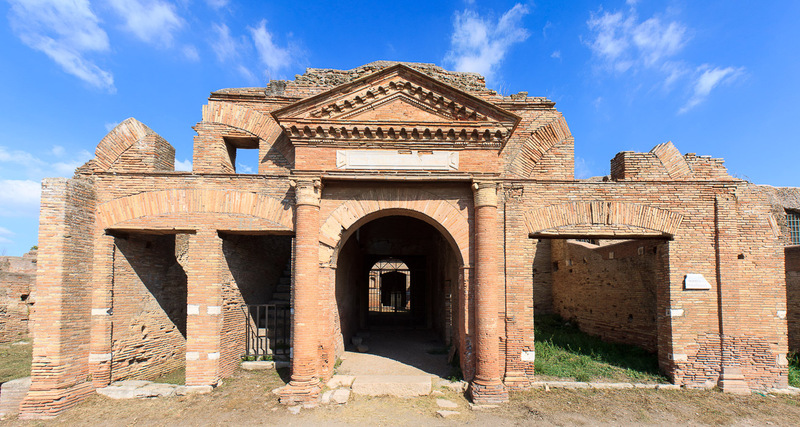 The front of the building (1st and 2nd photos below) features brick columns with capitals, an architrave with the inscription "HORREA EPAGATHIANA ET EPAPHRODITIANA", and a pediment. Behind the door is a double-vestibule, with two niches for a statue of a deity in the second. 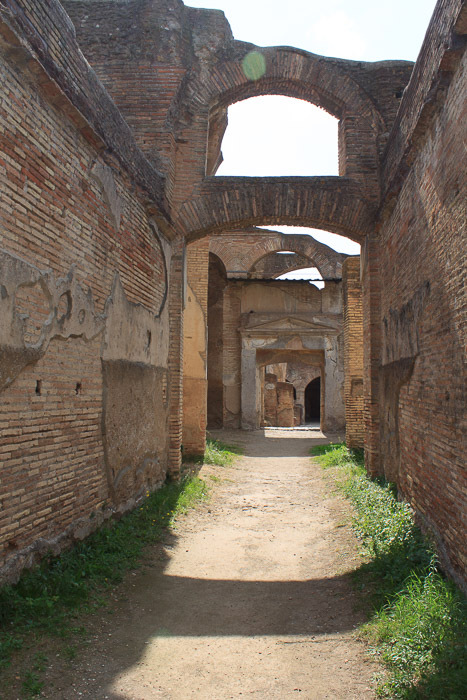 The interior (3rd photo below) is a square courtyard with rooms of various sizes on all four sides. 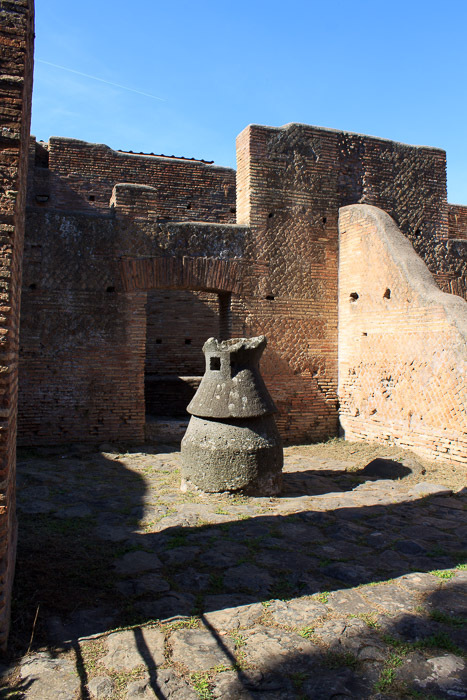 There are niches within the courtyard, similar to those in the second vestibule, surrounding the entrance to a deep room, perhaps an office. 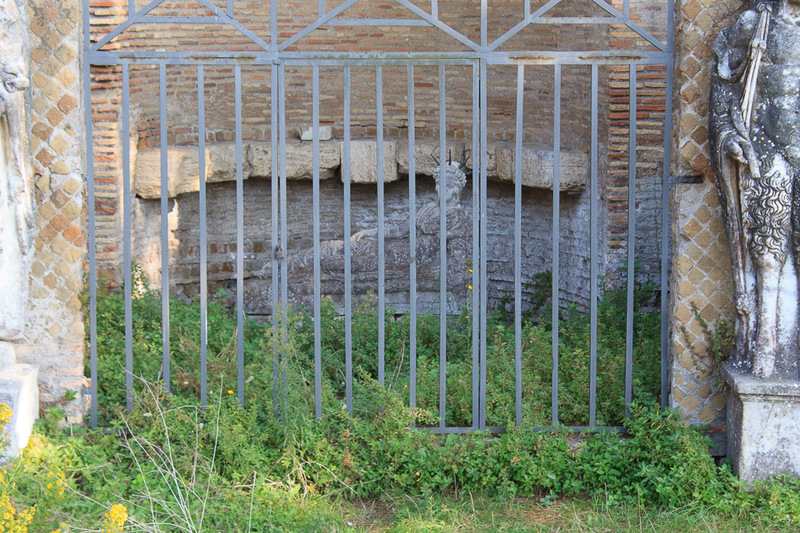 This is one of the few places in Ostia Antica where there is a gate preventing access to the interior of a building. You can see that the 3rd photo below is taken through a grating in the main doorway. 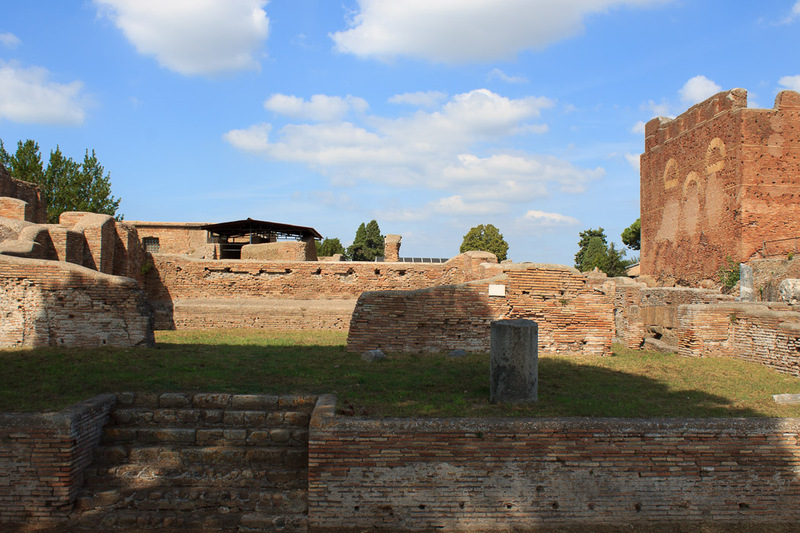 Walking east along the main road we pass by the Forum which we saw before, then on the right side is the courtyard of the guild seat of the builders (Caseggiato dei Triclini), shown in the 1st photo below. OK, cool enough, but the real highlight is at the southeast corner of this building where there is an intact public latrine (subsequent photos below). 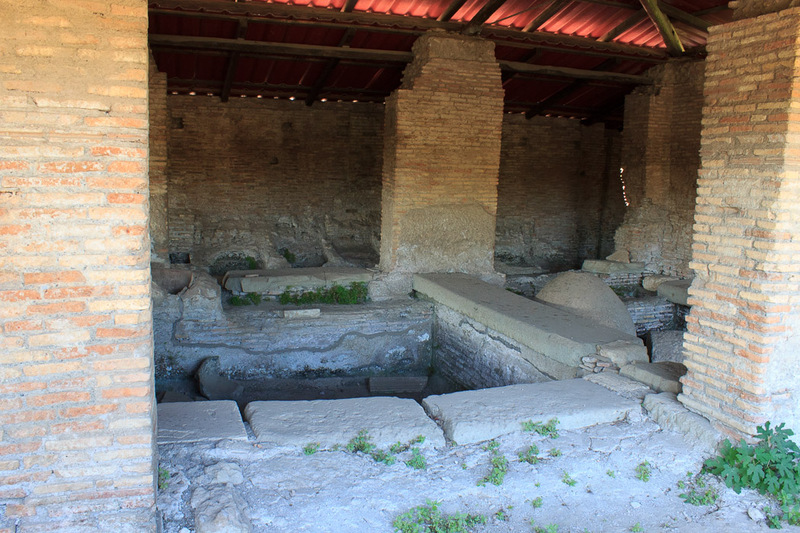 I found this to be the best preserved ancient latrine in all the sites I've seen in and around Rome. From pivot holes in the entrance (visible in the last photo below) it can be deduced that the entrances had revolving doors!. 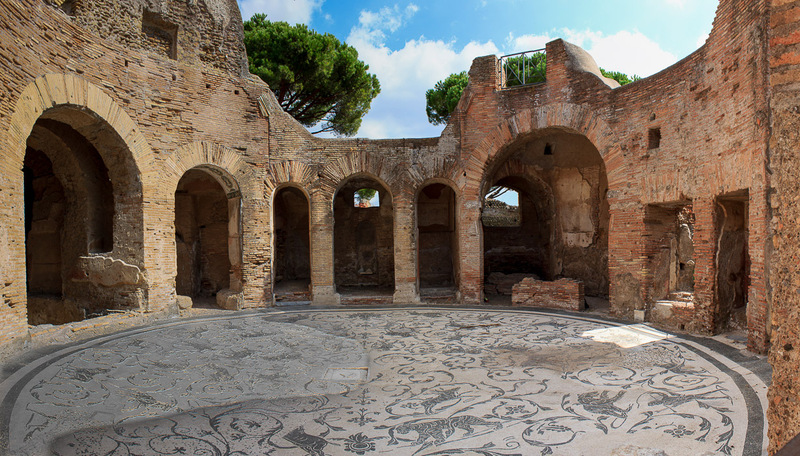 There are 20 marble seats; yes, you went to the bathroom in a large room with 19 friends or strangers! You sat above one of the holes, obviously, and the hole in front of you was for the stick with a sponge at the end that you used like we today use toilet paper. Not only that, but you shared your sponge with people on neighboring seats! 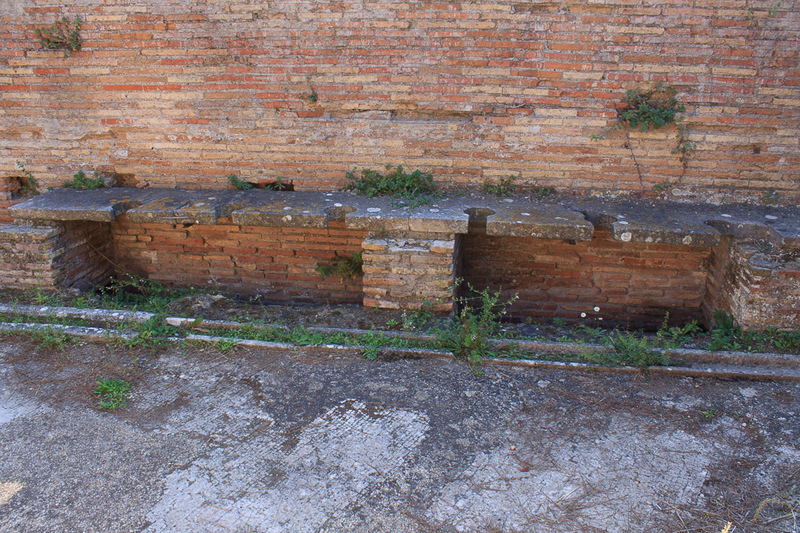 The trough in front of you on the floor had water running through it; it was used to get your sponge wet and maybe clean it a bit before using it. Just guessing here, but I'd think that trough might also wash down the "misses". 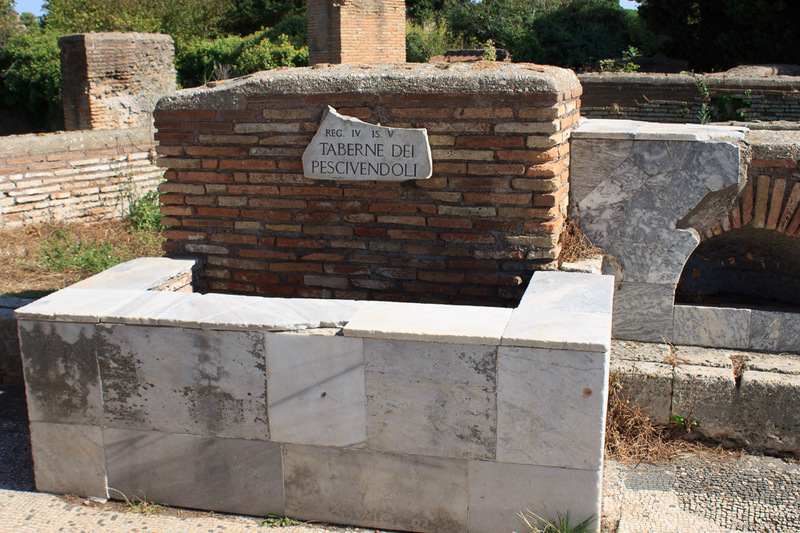 After using the latrine, you might need a bath. 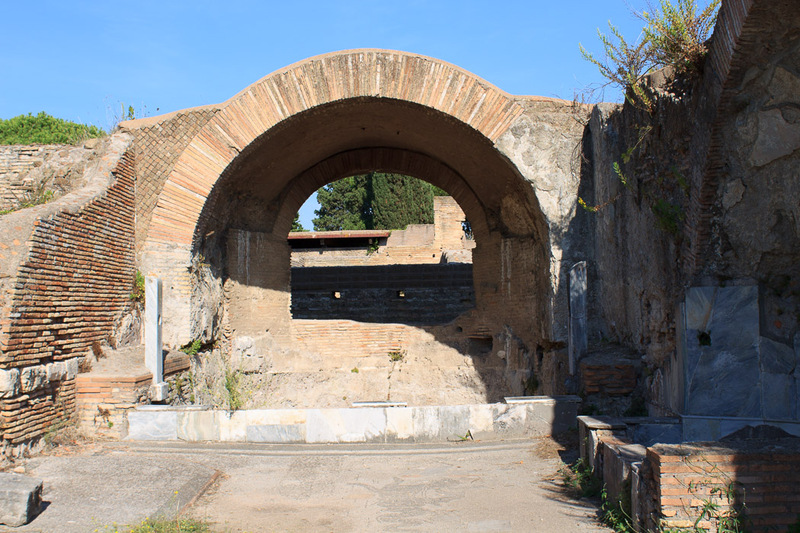 Lucky for you (or perhaps it's careful city planning), the Forum Baths were right next door. 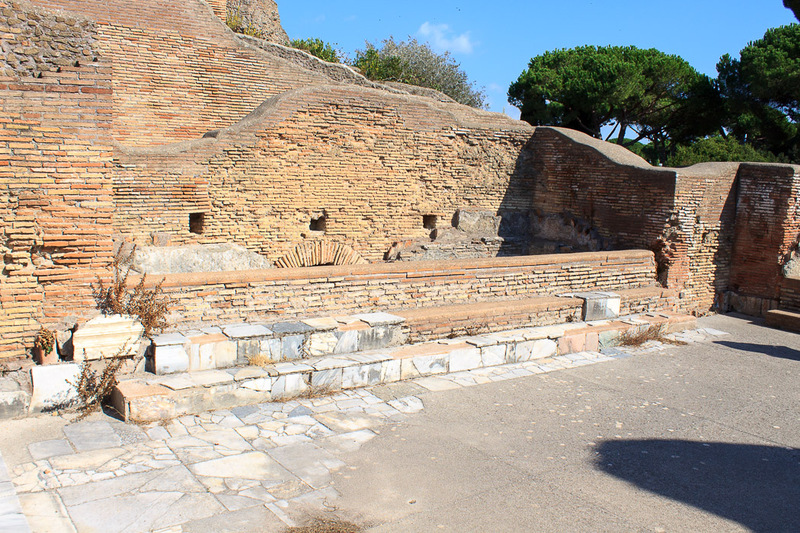 Unfortunately, I can't identify much of what I've seen in the Forum Baths, but what little I know of the photos below are explained by the captions. 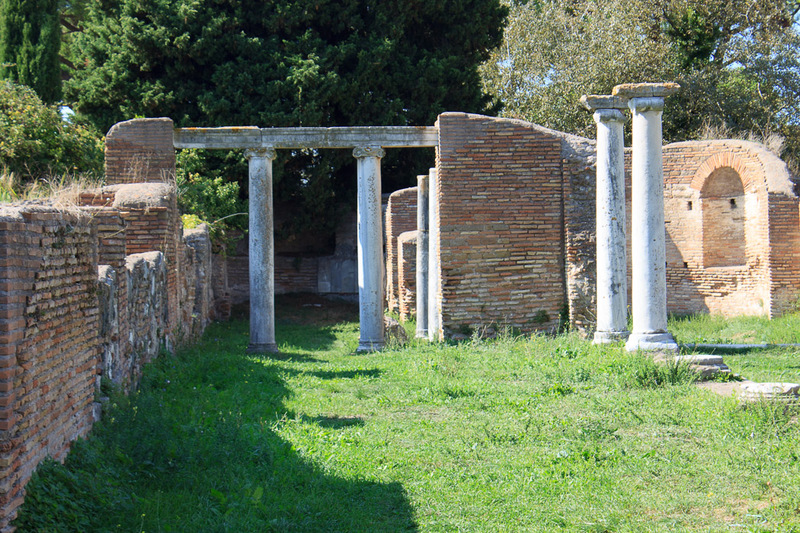 The Nymphaeum of the Erotes (Ninfeo Degli Eroti) was the brothel in Ostia Antica. 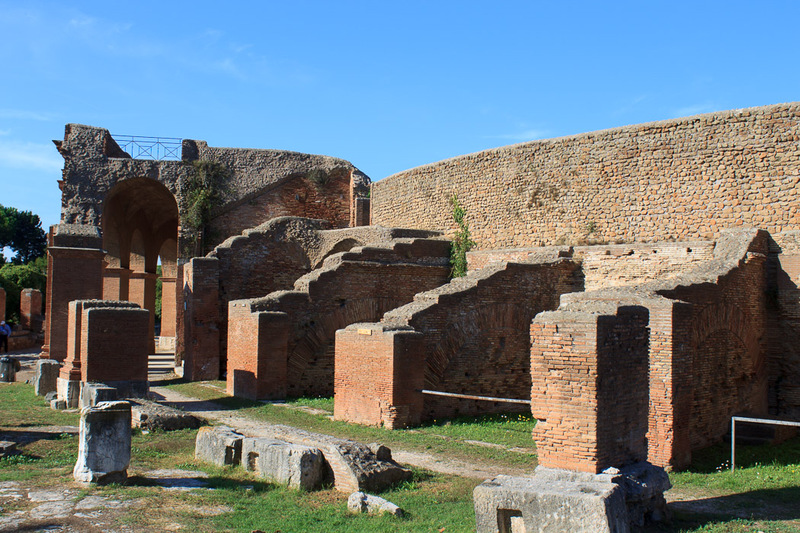 It was built in the first quarter of the fifth century. There's not much to see here beside a courtyard with a fountain in the center. 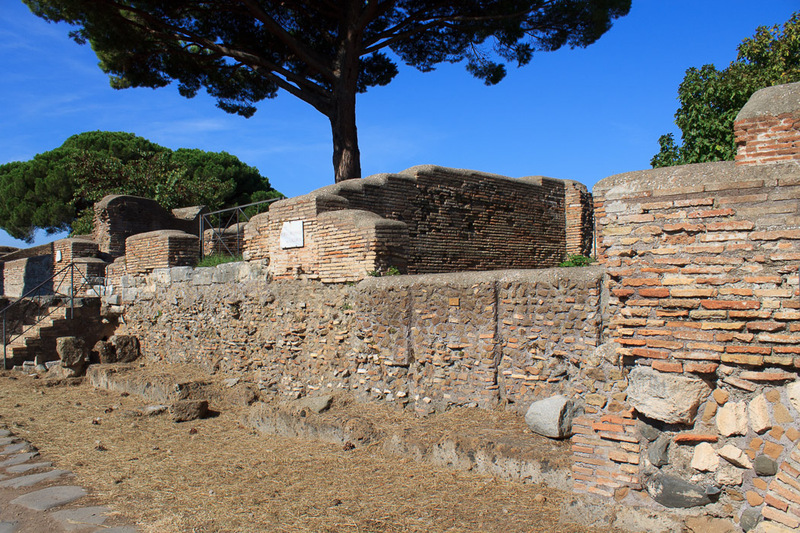 There's another ancient latrine in Ostia Antica, this one to the southwest of the Forum Baths. The marble piece from the front of the toilets is missing. 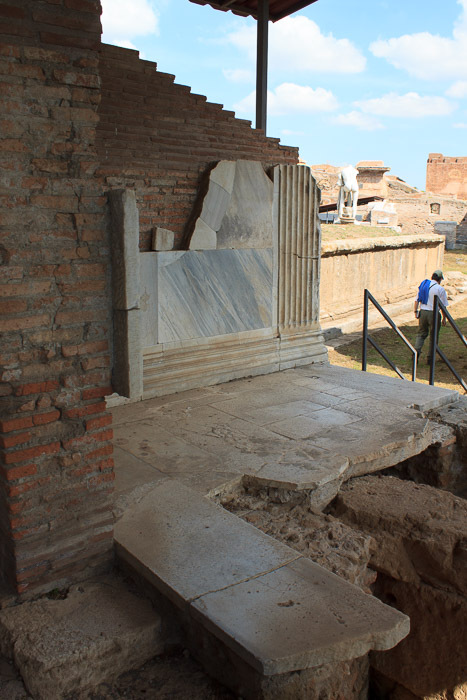 I don't know whether is was originally present in this latrine or not (marble is valuable and might have been stolen). The trenches in front of the seats are present here, though. 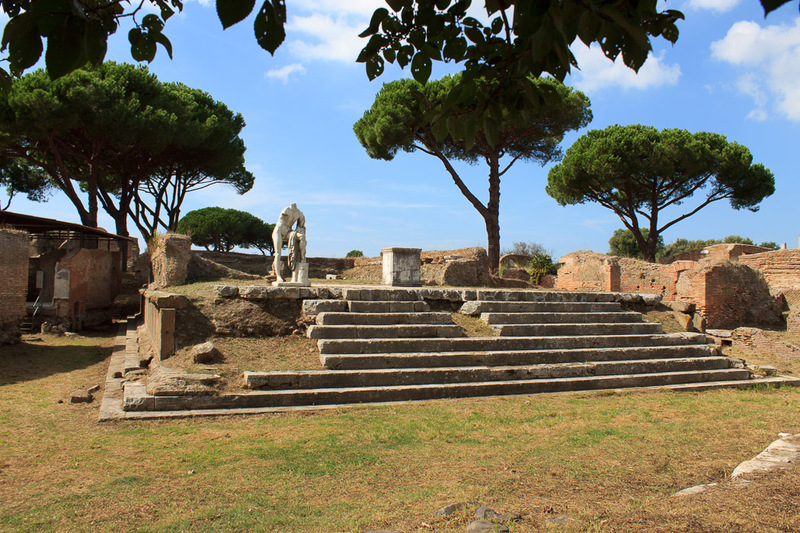 Down at the southernmost tip of Ostia Antica is the Field of the Great Mother (Magna Mater). 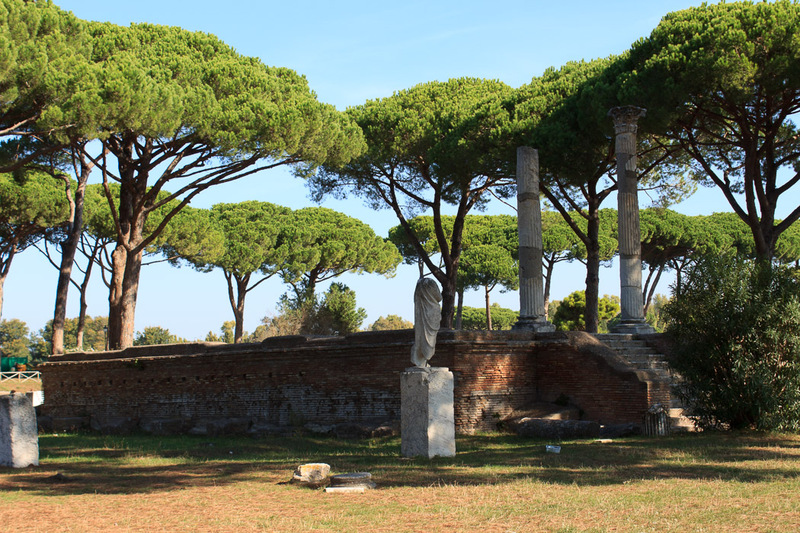 This is a temple to Cybele, an eastern godess of nature and fertility, located in a large field. 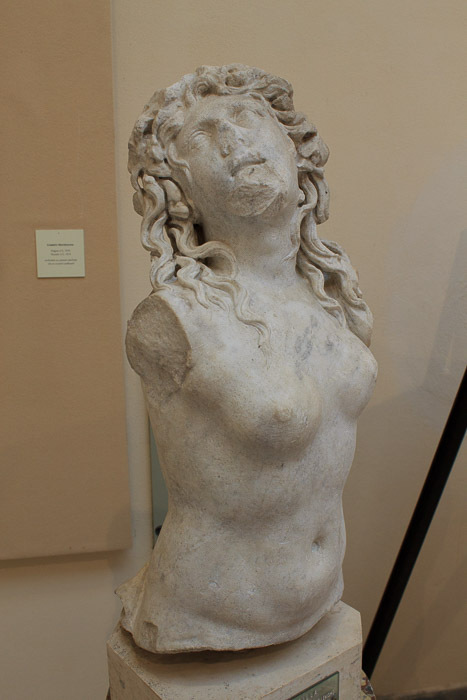 The feast of Cybele involved orgiastic rites, self-flagellation, and emasculation; just an overall Roman good time! 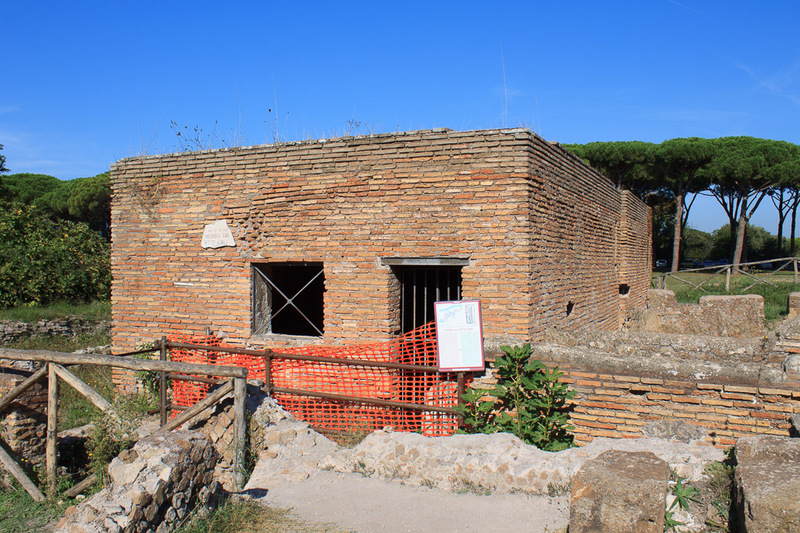 A residence from the period of Augustus is nearby (1st photo below), as are the walls of the Castrum (2nd and 3rd photos below), which was the first settlement that has been found in Ostia Antica, dating from somewhere between 400 and 267 BC. It was a rectangular military fortress. 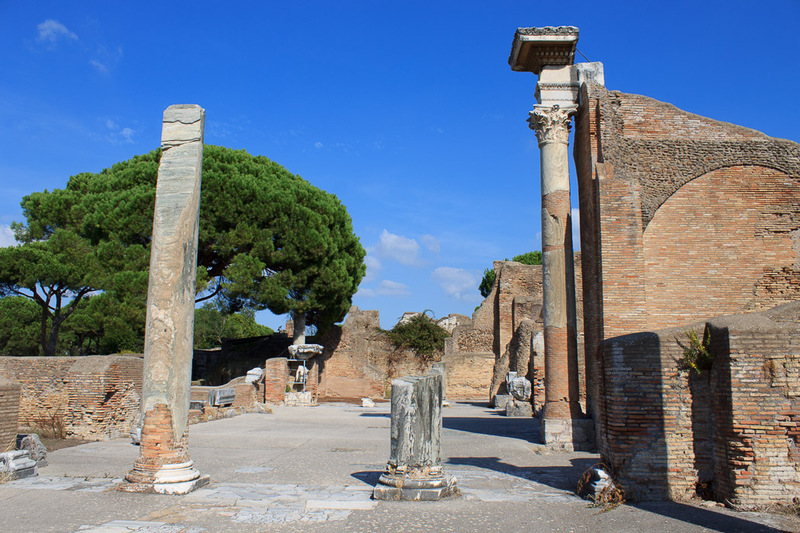 Most historians suggest it was erected in either 349-348 or 338 BC, a period when Rome had to battle pirates and was at war with its neighbors, or perhaps 278 BC, when a Carthaginian fleet reached Ostia. 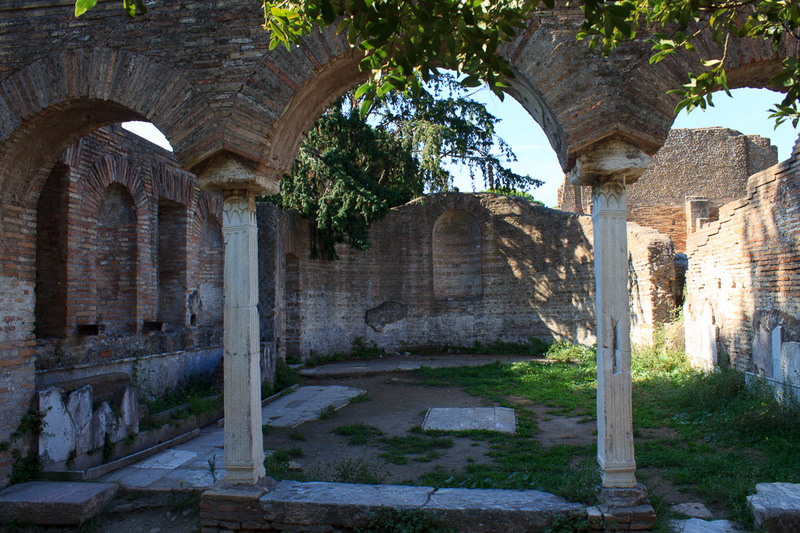 The House of the Porch was named after the marble porch in front of the entrance, consisting of columns supporting a tympanium (1st photo below). 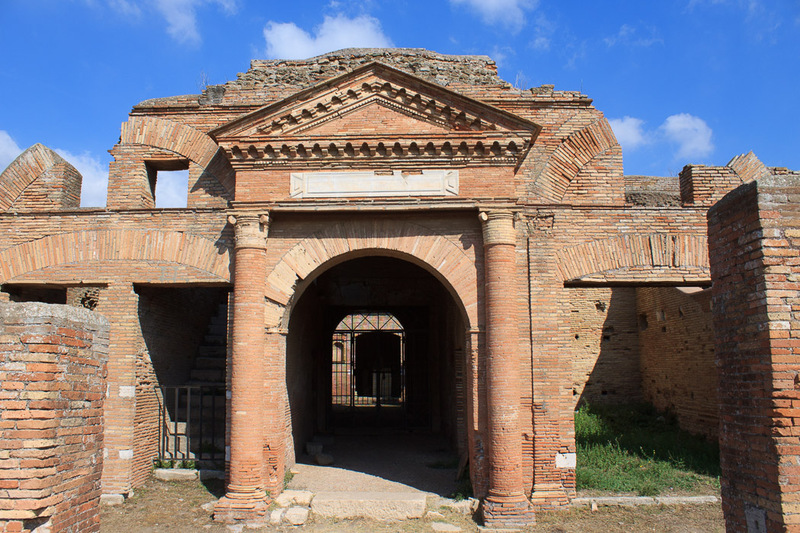 The center of the house contains a beautiful courtyard (2nd and 3rd photos below), with a double nymphaeum (under the two marble arches in the photo) decorated with marble. 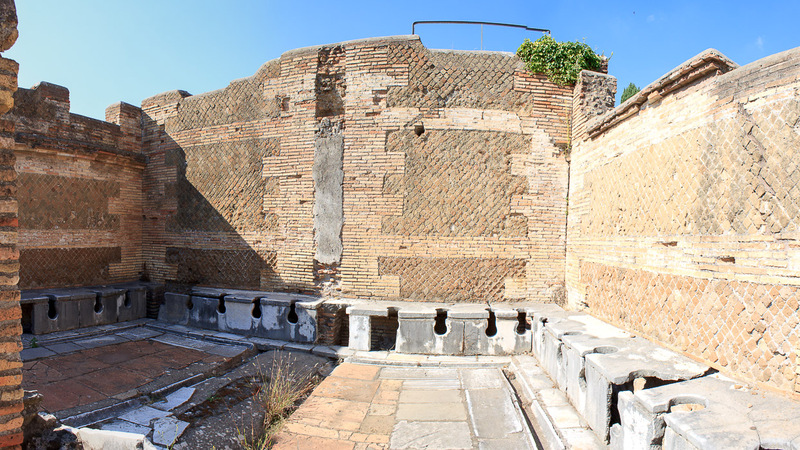 The two niches and the basin in front of them formed the nymphaeum. 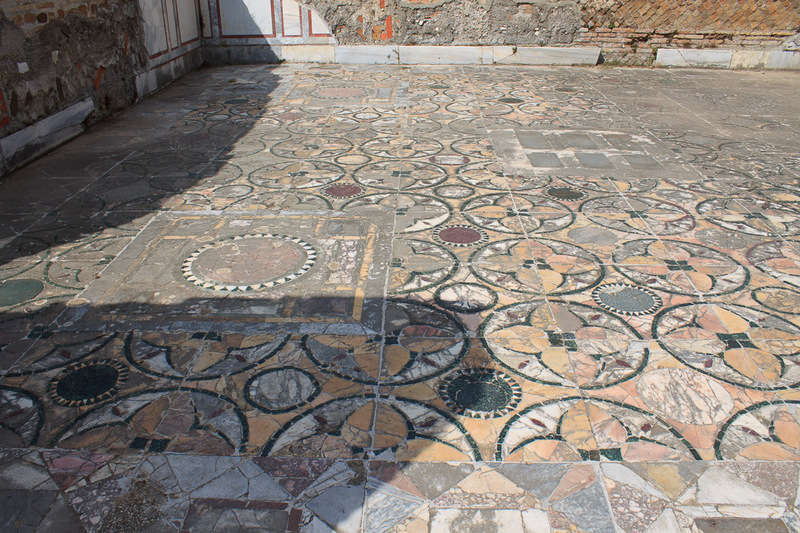 A round mosaic (4th photo below) is in the room behind the courtyard. 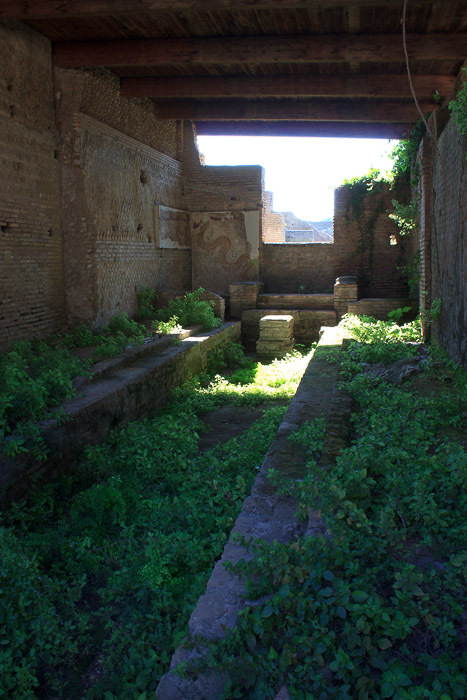 To the north of the House of the Porch are the Baths of the Philosopher, which were private baths in a house in Ostia Antica. Part of the house might originally have been a temple, and one room of the house might have been a school. 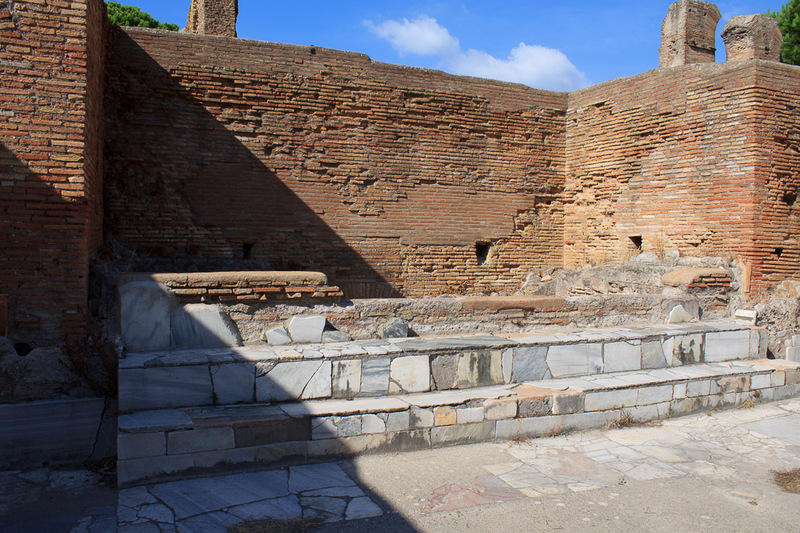 The baths were installed in the second half of the third century. 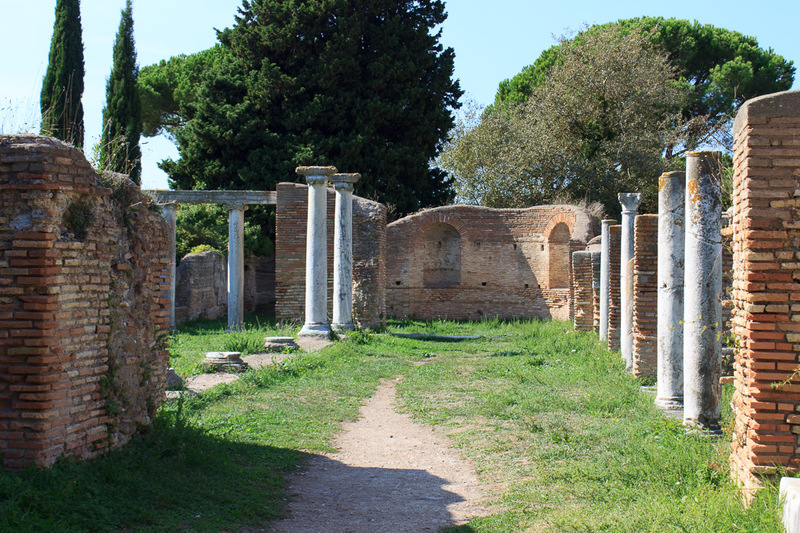 The House of the Fortuna Anonaria was another large house in Ostia Antica, built around 150 AD. with 19 rooms. 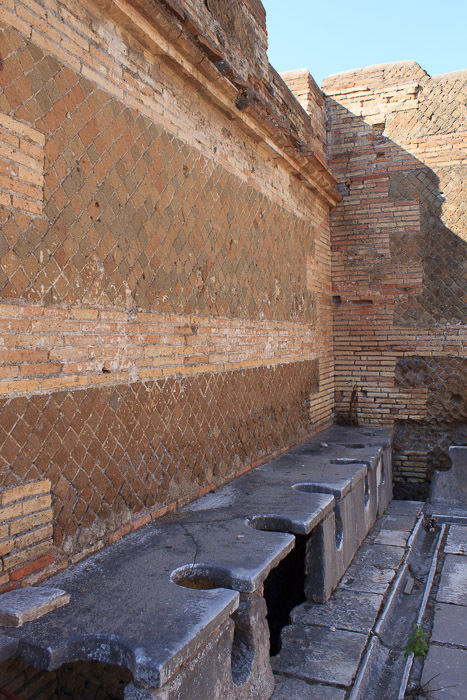 There was a major remodelling during the first quarter of the 4th century. 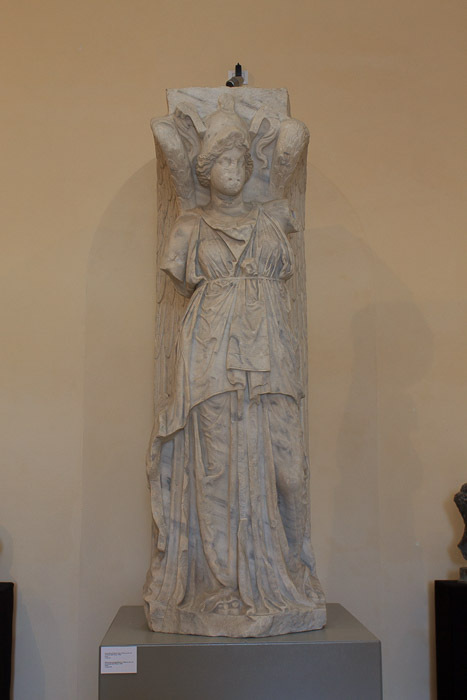 Apparently in one room is a statue of a woman sitting on a throne, holding a cornucopia. It is thought that she represents the Fortuna of the grain supply. 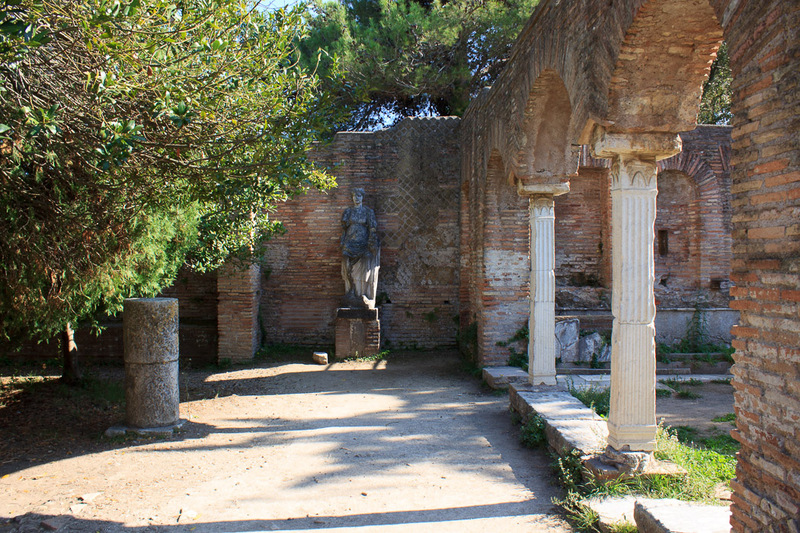 The 1st photo below shows a hallway with a statue of the "Personification of Ostia" at the end. Turning to the right from that photo reveals the view in the 2nd, 3rd and 4th photos below. 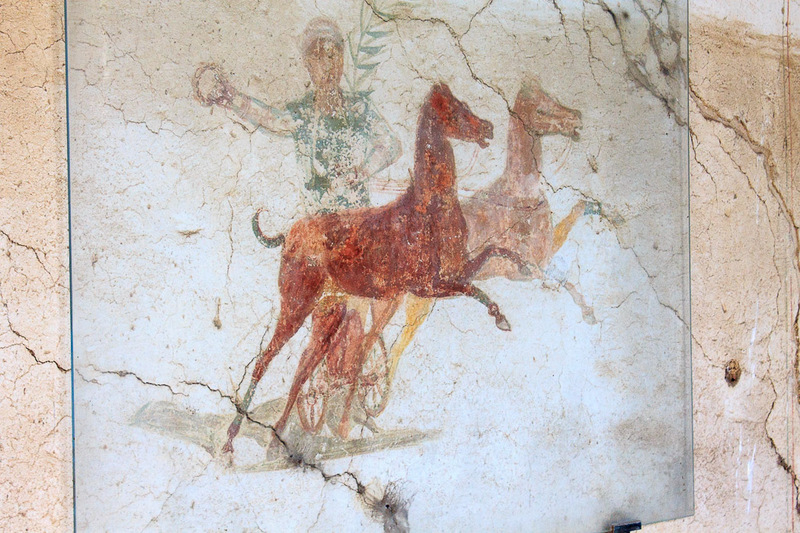 There is quite a large mosaic in one of the rooms. 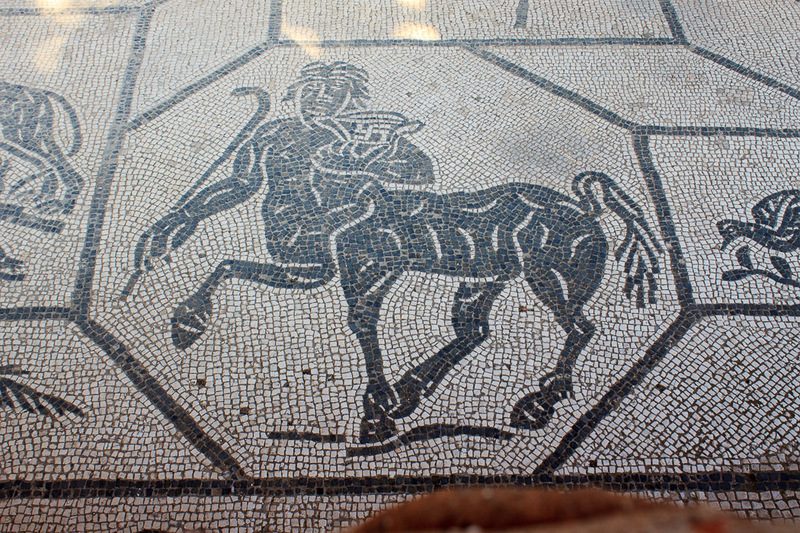 I don't know why I didn't take a photo of the entire mosaic, but the 5th photo below shows the part that I did take a photo of, a centaur. 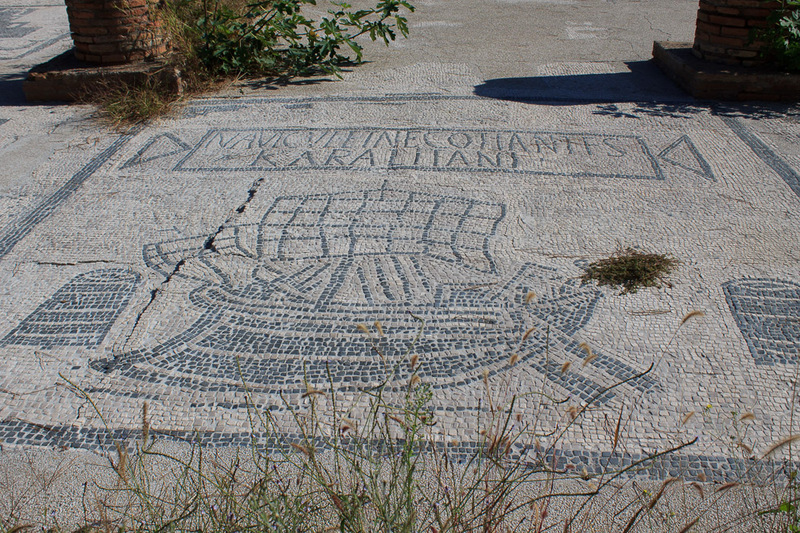 This is one-ninth of the complete mosaic. The archway shown in the 6th photo below was in this house, but I don't know the context or significance. 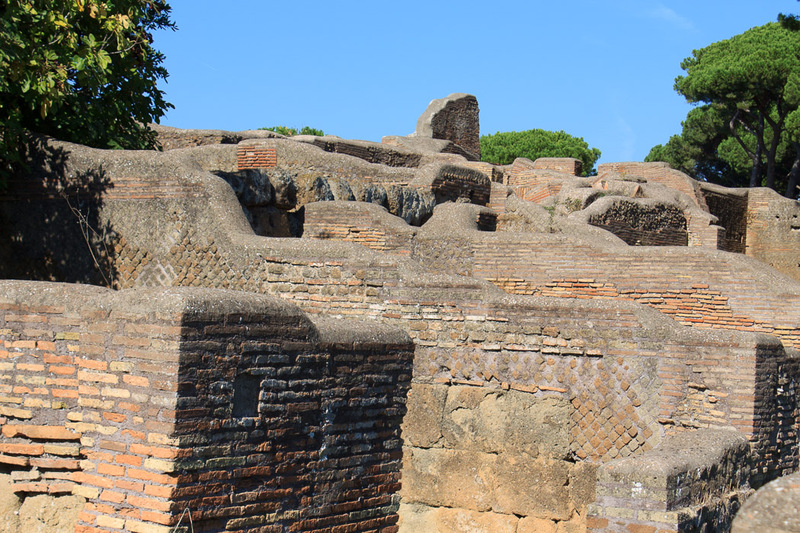 It should be obvious that I was completely out of energy at this point; this was 6-1/2 hours since I'd begun touring Ostia Antica, and this old man was ready to sit on a metro for a 45-minute trip back to Rome, take a shower, and go relax at a nice dinner. 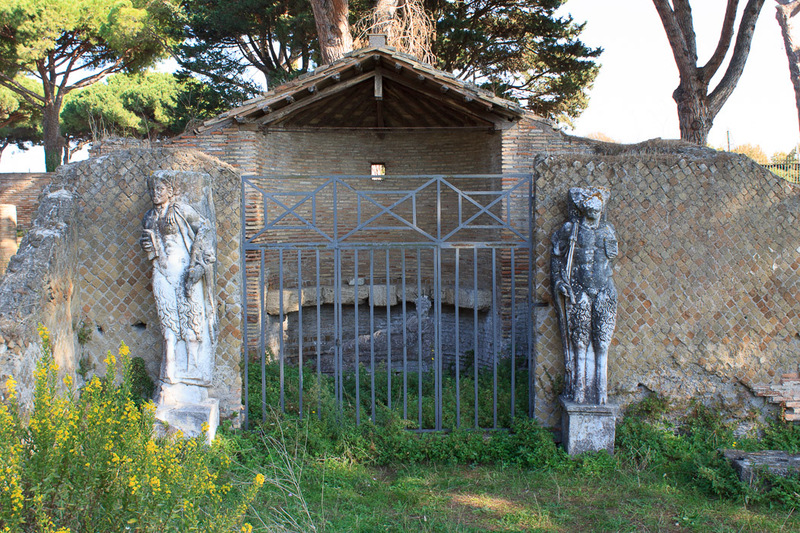 House of the Fortuna Anonaria, a house in Ostia Antica. 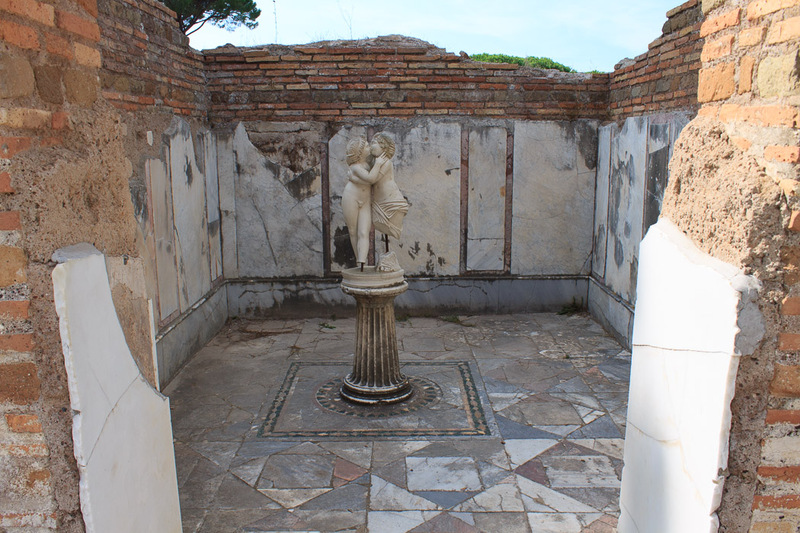 The statue at the end is the "Personification of Ostia".